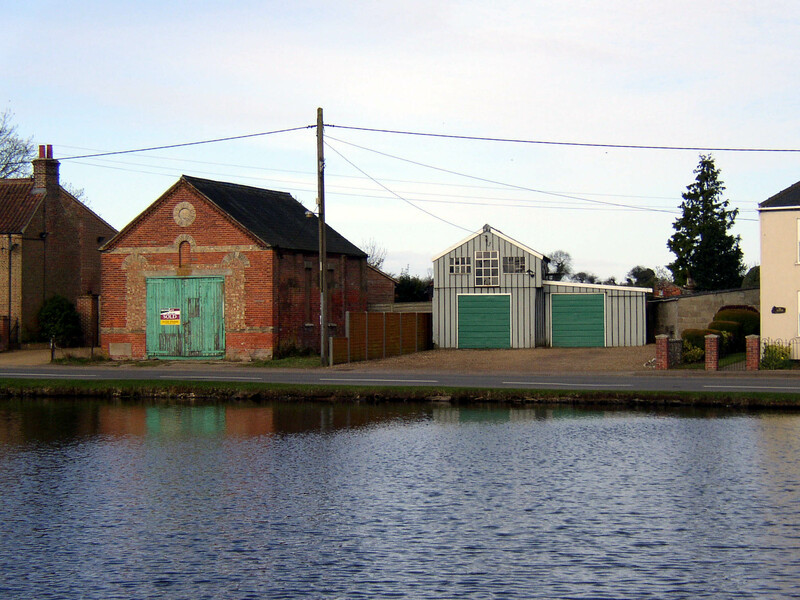 Depots, out-stations, works and offices . . . These premises were built just after the formation of the Company in 1931 to house the offices of the General Manager, Secretary & Accountant, Traffic Manager, Chief Engineer and their respective staffs. The premises were extended westwards in 1971 to provide accommodation for staff previously housed in offices within Central Works. 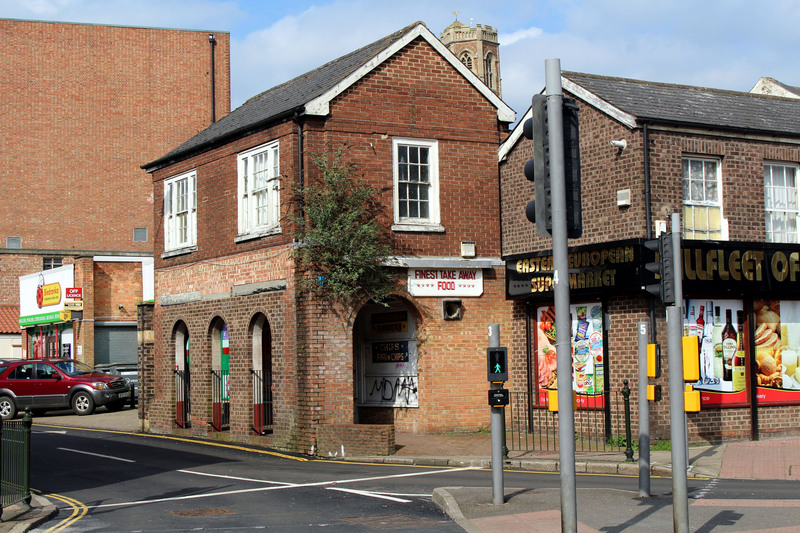 The garage in Gordon Road was originally built as a cinema (The Regent), but was converted by United Automobile Services Ltd into a car showroom and garage in the 1920s. 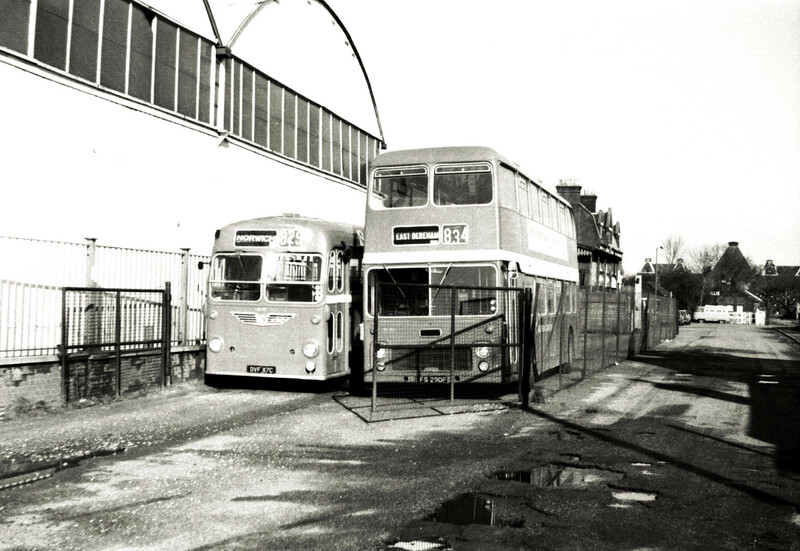 It later became a garage for United's omnibuses which shared space with the motor cars for which United had an agency for. 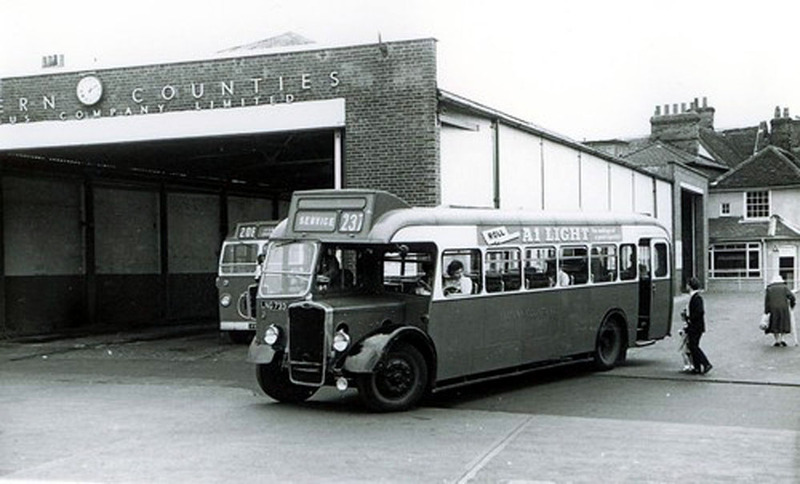 In 1931, under Eastern Counties ownership, the building became purely a bus garage offering a local maintenance facility, with adjacent land, originally purchased by United, being developed into an open air bus station with a covered, seated passenger waiting area which opened towards the end of 1936. 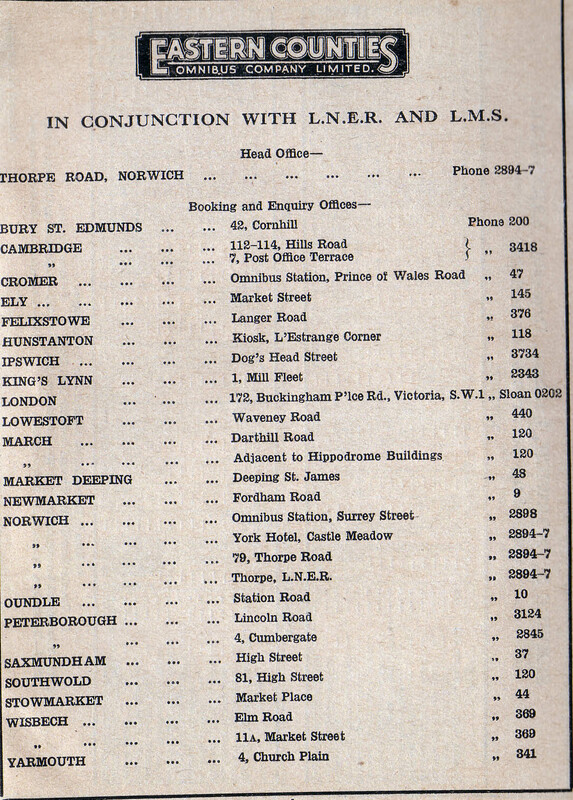 Later extensions included an enquiry and travel office fronting London Road North. 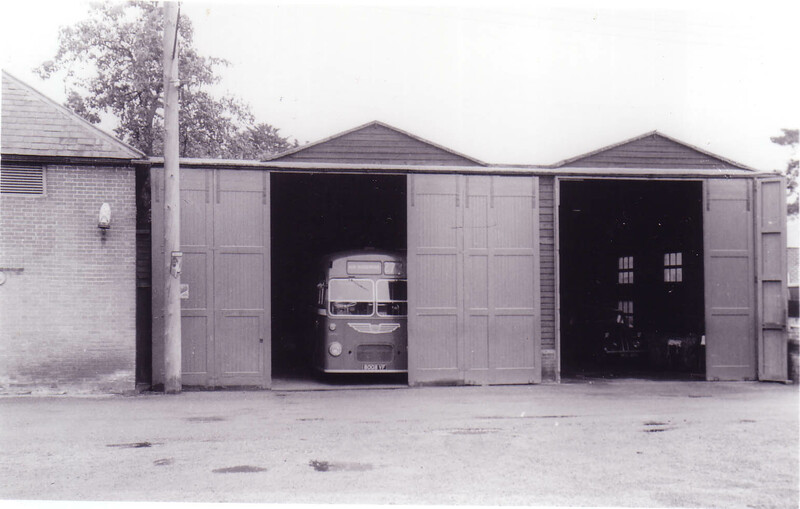 An omnibus garage in Cambridge Road was established by Ortona Motor Company Ltd on 10 April 1928 when that Company extended its services to this small cathedral city. 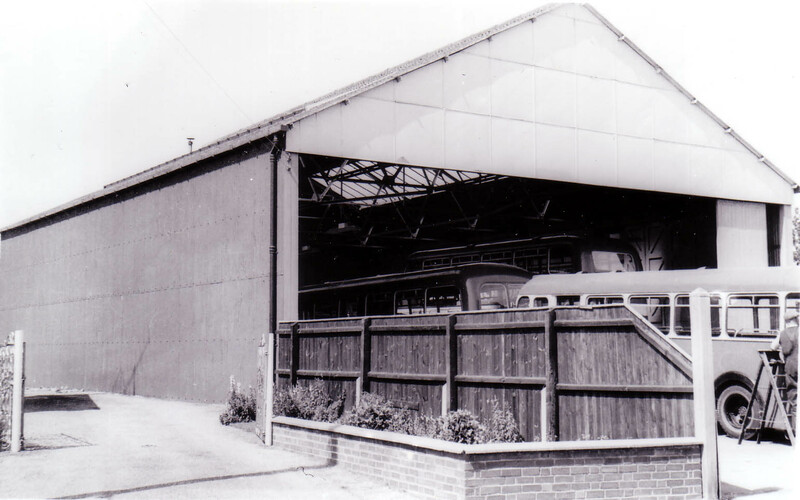 Apart from Eastern Counties adding a booking and enquiry office in 1956, very little in the way of alteration was done to this modest depot. The premises provided local maintenance and ancillary staff facilities. The garage in Fordham Road was another established by predecessor Company, Ortona Motor Company Ltd when they commenced services in the British horse racing capital in 1925. 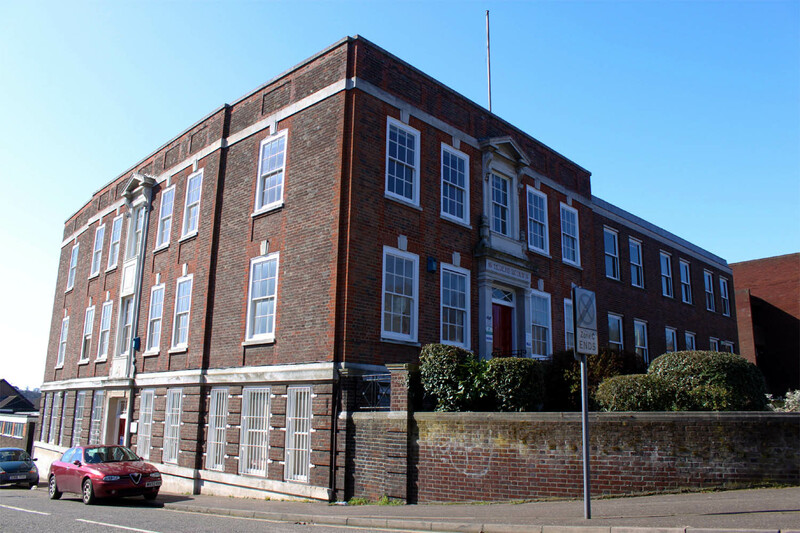 The premises remained basically unaltered under Eastern Counties ownership, apart from a couple of small extensions to the rear and to the left hand side to house a booking and enquiry office. 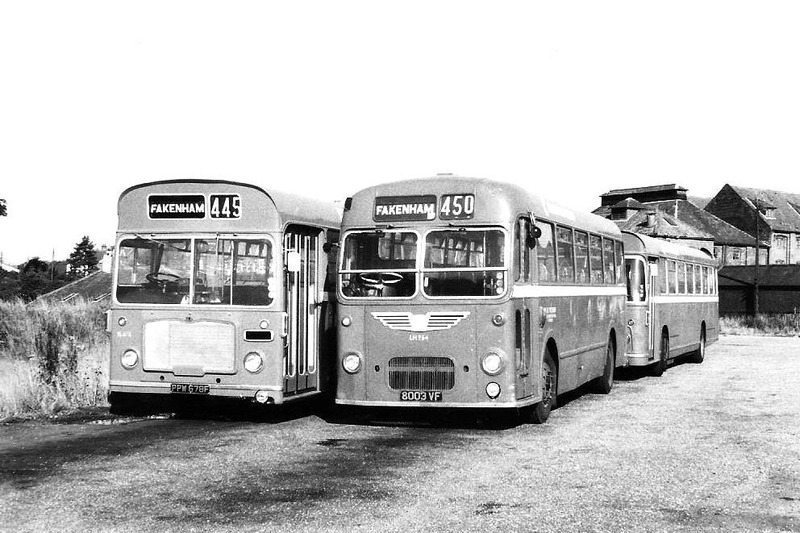 Buses calling at the town used bus stands close by the depot in Fordham Road. 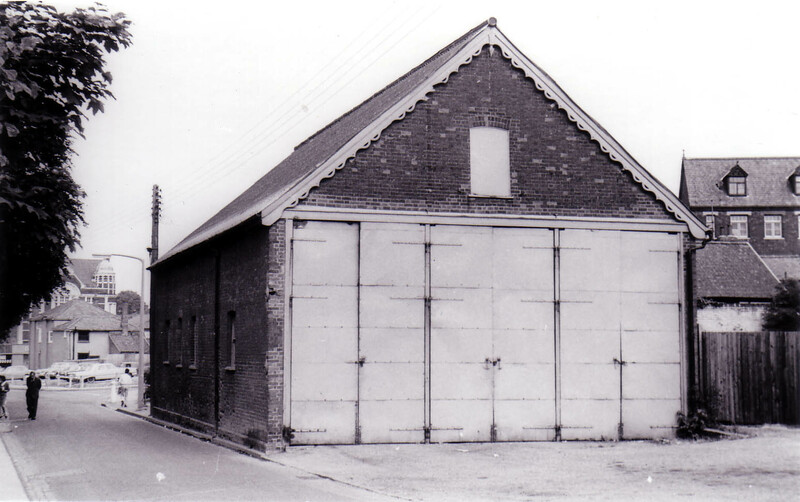 The garage in Elm Road also dates back to the days of Peterborough Electric Traction Company Ltd. 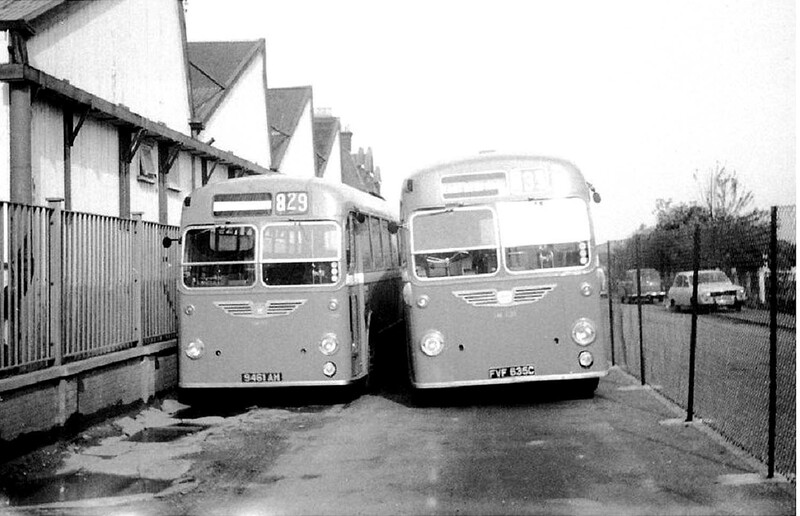 It was a modest garage housing a small number of buses with a local maintenance facility. In 1936, a booking and enquiry office was established at 11A, Market Street, which later moved to 9, Market Street in 1953. Opened by ECOC on 1 August 1976. Closed on 26 July 1986. Location: Parking Ground, Railway Station, Station Road from 1 Aug 1976 to 26 Jul 1986. Opened by United Automobile Services Ltd by 1 August 1930. Closed on 26 February 1983. Locations: 1. Smiths Garage, London Road from 1 Aug 1930 to ?? 1974 (pictured above left?) and 2. Bear Hotel, Queens Road from 1 Aug 1930 to ?? 1974. 3. 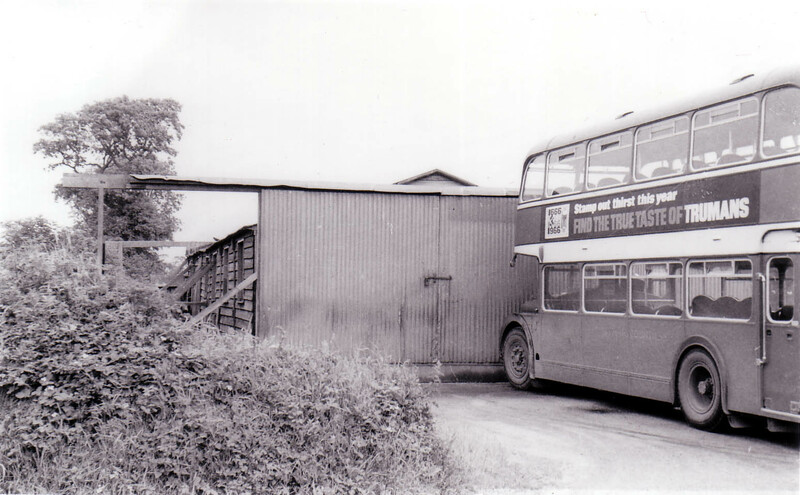 Browns Garage (Norfolk Coachways), Hargham Road from ?? 1974 to 26 Feb 1983 (pictured above right). Opened by ECOC by 1 June 1936. Closed on ?? February 1996. Locations: 1. Watts & Sons (Car Dealer), Norwich Road from 1 Jun 1936 to ?? Mar 1978 (pictured above left). 2. Parking Ground, Old South Railway Station from ?? Mar 1978 to ?? Sep 1989 (pictured above right). 3. Keymers Garage, Norwich Road from ?? Sep 1989 to ?? May 1990. 4. 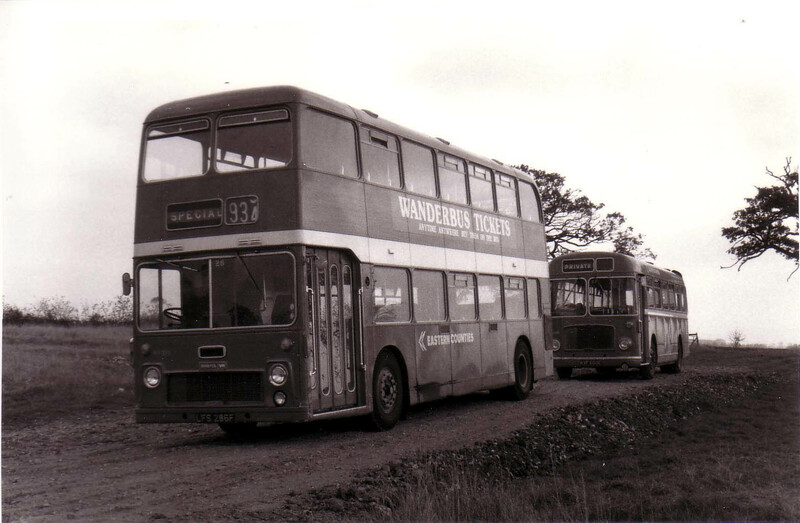 Rowlands Industrial Estate from ?? May 1990 to ?? Mar 1995. 5. 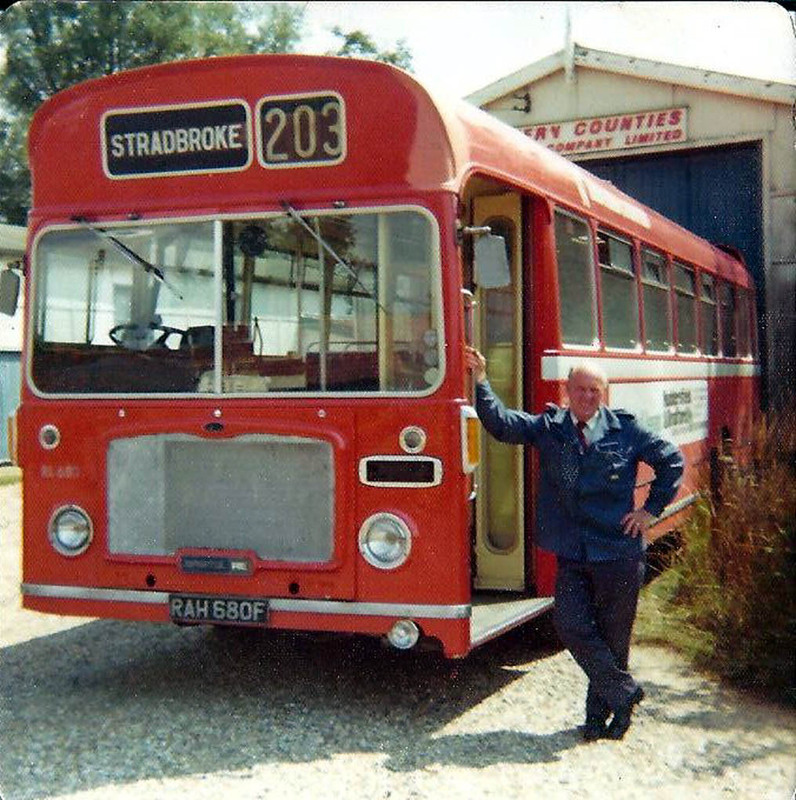 Eastons Coaches, off Parish Road, Stratton Strawless from ?? Mar 1995 to ?? Feb 1996. Opened by ECOC by ?? November 1959. Closed on 21 September 1981. Locations: 1. Railway Station yard from ?? Nov 1959 to ?? 2. Nightingales Garage, 26, Northgate from ?? to 21 Sep 1981. Opened by United Automobile Services Ltd by 1 August 1930. Closed on ?? March 1973. Location: Pyes Garage, Morston Road from 1 Aug 1930 to ?? Mar 1973. Opened by United Automobile Services Ltd by 1 August 1930. Closed on ?? January 1999. Locations: 1. Sheds and Parking Ground, Priory Lane (off St Mary's Street) from 1 Aug 1930 to ?? Jan 1999 (pictured above). 2. 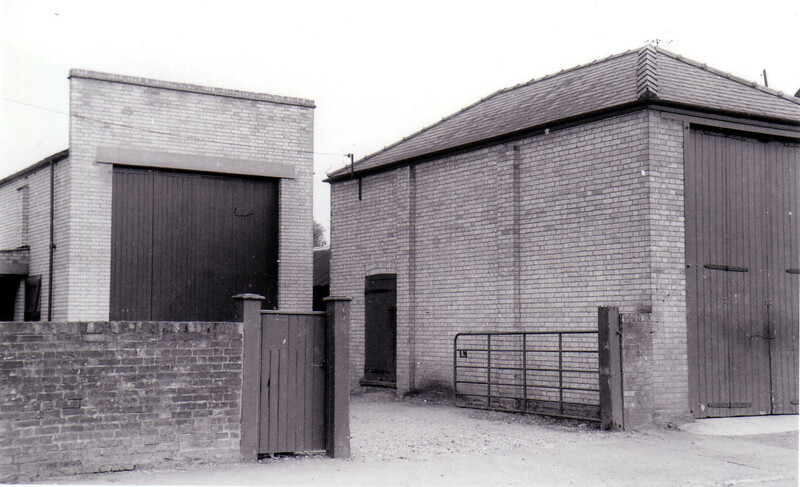 Ellingham Grain Store, Geldeston Road, Ellingham from ?? Jan 1999 to ?? Jan 1999. 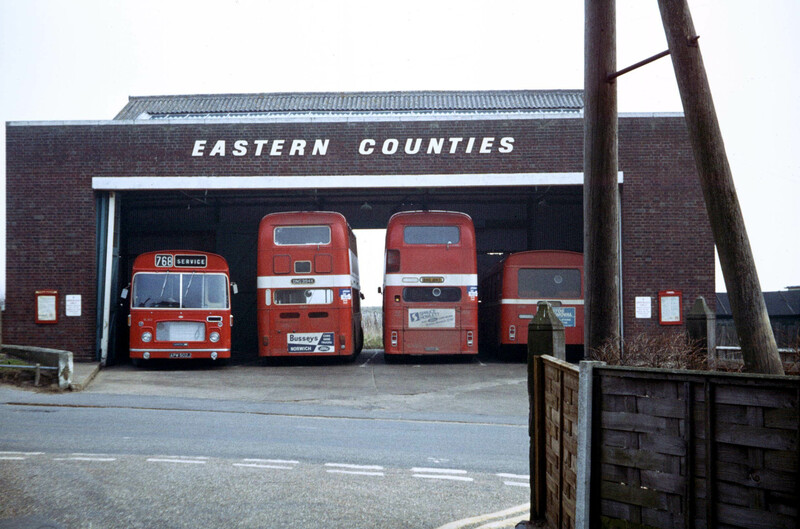 Opened by ECOC on 31 March 1985 (upon closure of New Buckenham). Closed on 28 October 2006. Locations: 1. Open parking at rear of Day's Garage, The Street from 31 Mar 1985 to 10 Feb 2001. 2. Eastons, The Turnpike from 11 Feb 2001 to 28 Oct 2006. Opened by ECOC by ?? September 1956. Closed on 17 August 1980. Locations: 1. Old Slaughterhouse, Chapel Street from ?? Sep 1956 to ?? (pictured top left). 2. 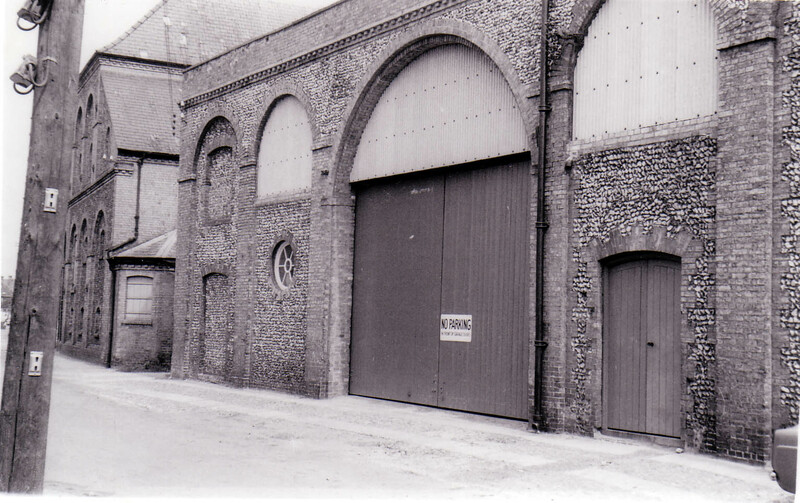 Open parking at Key's Auctioneers Yard, (opposite Market Place) from ?? to ?? May 1975 (pictured top right). 3. Open parking at The Grange (near Ratcatchers PH) from ?? May 1975 to 17 Aug 1980 (pictured bottom). Opened by United Automobile Services Ltd by 1 August 1930. Closed on 2 June 1996. Locations: 1. Wright's Garage, London Road from 1 Aug 1930 to ?? Oct 1964. 2. Railway Station Yard from ?? Oct 1964 to ?? Jun 1988 (pictured above). 3. Wright & Plowright, London Road from ?? Jun 1988 to ?? Dec 1994. 4. Farm & Country, London Road from ?? Dec 1994 to 2 Jun 1996. Opened by United Automobile Services Ltd by 1 August 1930. Closed on 1 April 2006. Locations: 1. 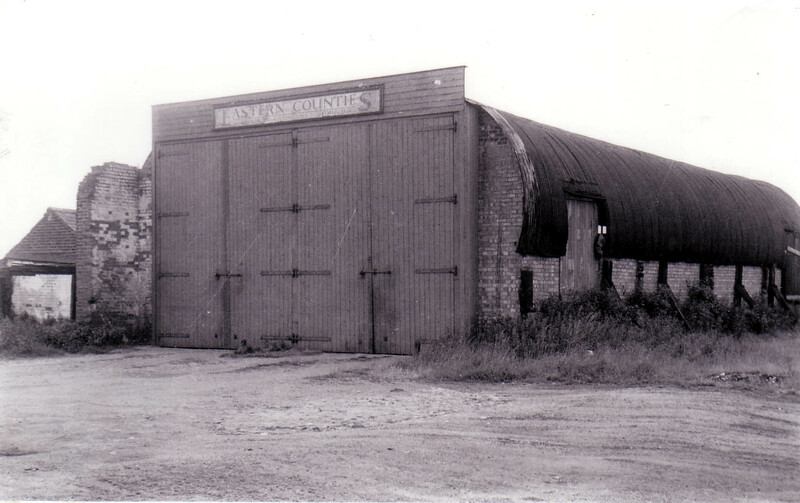 Railway Shed and open parking, Fakenham East Station (off Norwich Road) 1 Aug 1930 to ?? (pictured above & below). 2. Open parking at Bridge Street Car Park from ?? to 9 Nov 1984. 3. Open parking at Highfield Road Car Park from 9 Nov 1984 to ?? Mar 1998. 4. Rear of Aldiss Department Store Car Park, Oak Street from ?? Mar 1998 to ?? 2003. 5. 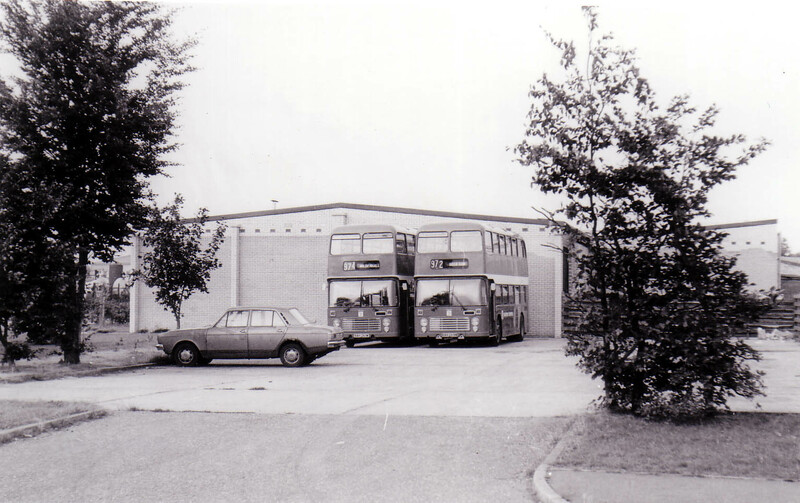 Aldiss Distribution Centre, Norwich Road from ?? 2003 to 1 Apr 2006. Opened by ECOC by ?? September 1944. Closed on 13 December 1981. Locations: 1. 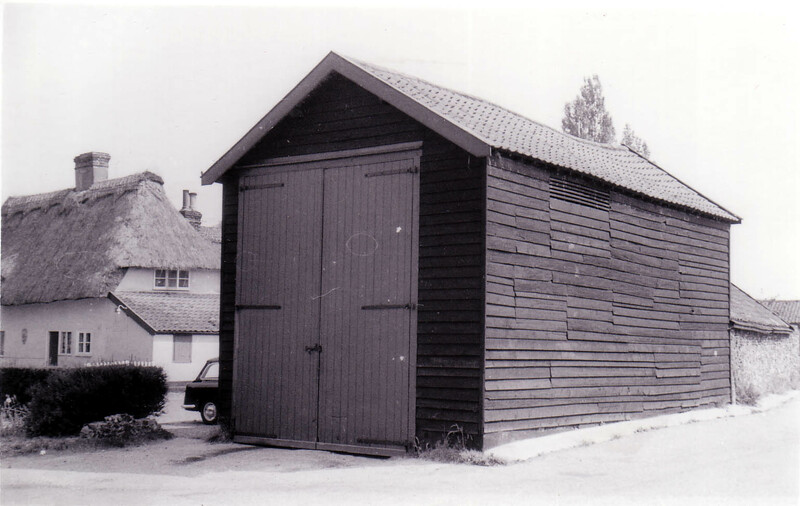 Shed adjacent to the Swan Inn PH from ?? Sep 1944 to 24 Jun 1978 (pictured above). 2. Haulage Yard at ?? from 25 Jun 1978 to 13 Dec 1981. Opened by United Automobile Services Ltd by 1 August 1930. Closed on 3 January 1981. Locations: 1. Shed at Prime & Cowles, Market Place from 1 Aug 1930 to ?? (pictured above). 2. 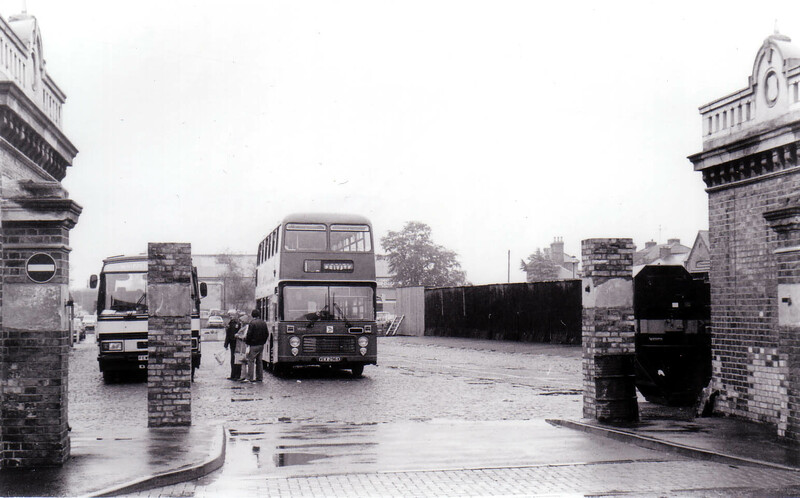 Bus stands at Steeple End from ?? to 3 Jan 1981. 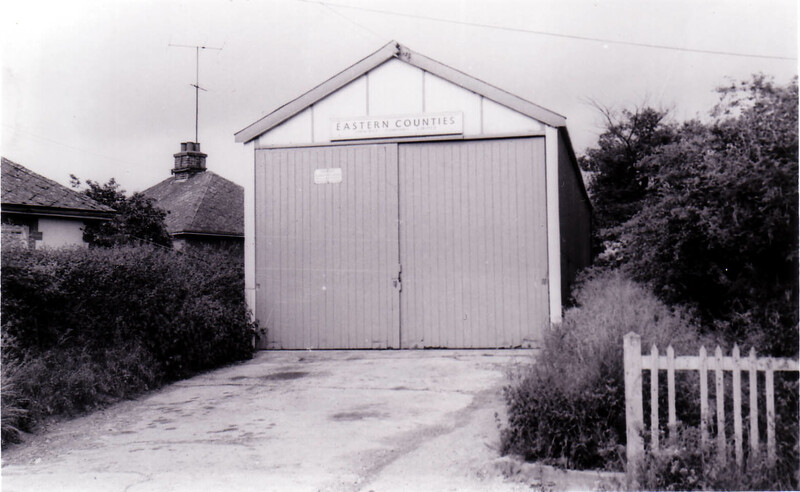 Location: Shed in Wilderness Lane from 1 Aug 1930 to 3 Jan 1981. Opened by ECOC by 1 March 1959. Closed on 27 November 1982. Locations: 1. 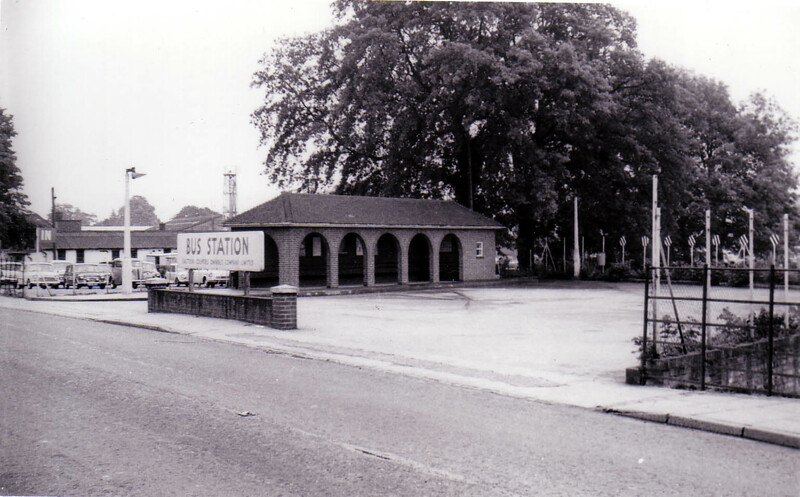 Holt Railway Station (upon closure of M&GN Railway on 28 Feb 1959) from 1 Mar 1959 to ??. 2. 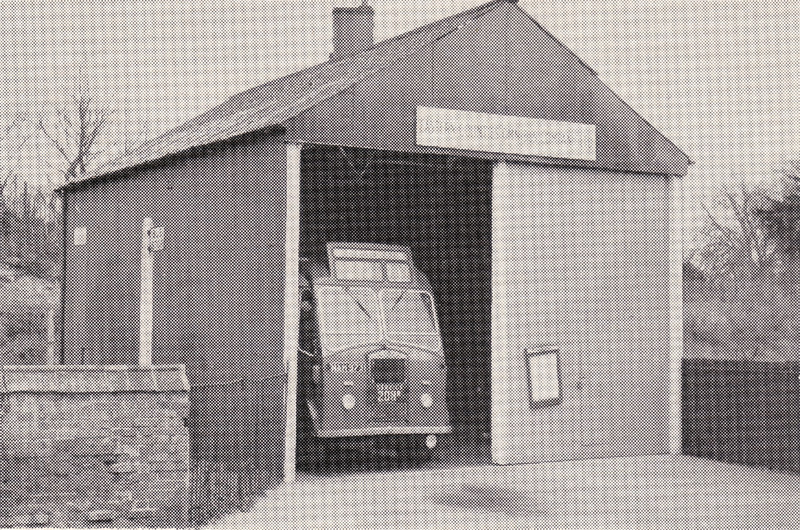 Elsdon's Garage, Cromer Road from ?? to ?? (pictured above). 3. 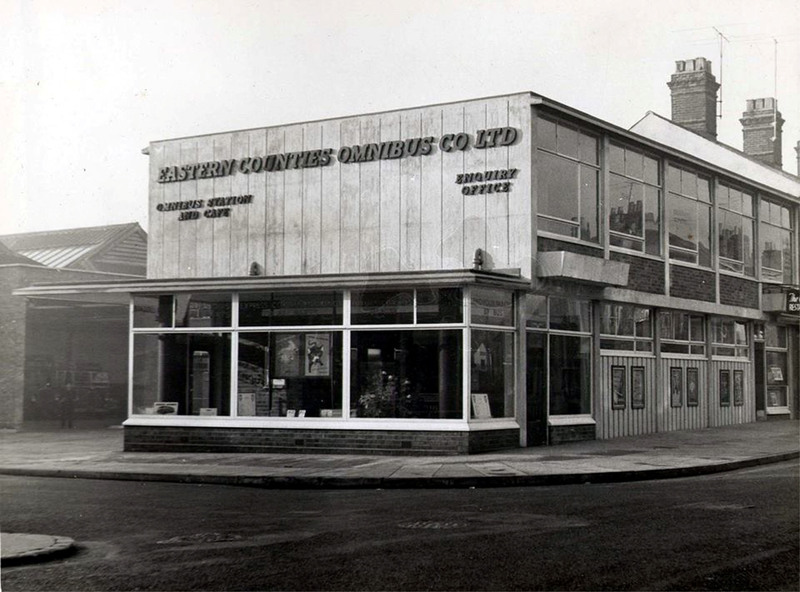 Wright's Cash & Carry Store, Albert Street from ?? to 27 Nov 1982. Opened by ECOC by ?? March 1939. Closed on 4 January 1998. Locations: 1. 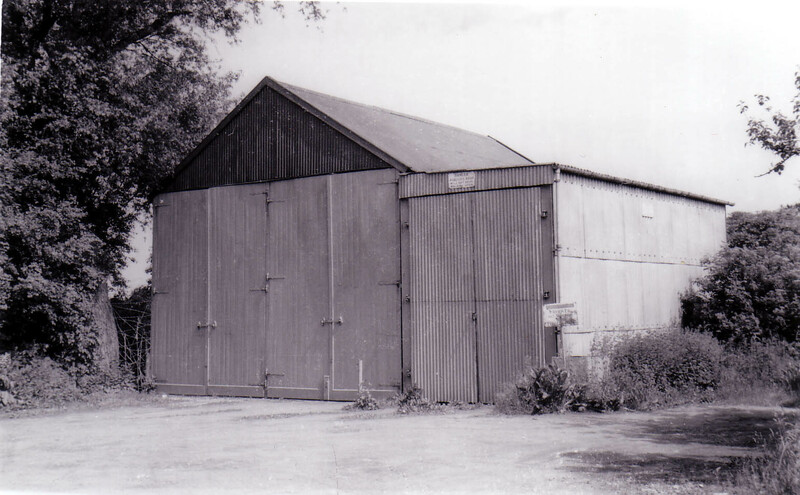 Shed at rear of Swan Hotel from ?? Mar 1939 to ?? Feb 1973. 2. Staithe Car Park from ?? Feb 1973 to ?? April 1980 (pictured above). 3. Parking ground at Fox & Hounds PH from ?? Apr 1980 to ?? Mar 1993. 4. Open parking adjacent to Anglian Coaches premises, Little Money Road from ?? Mar 1993 to 4 Jan 1998. Locations: 1. 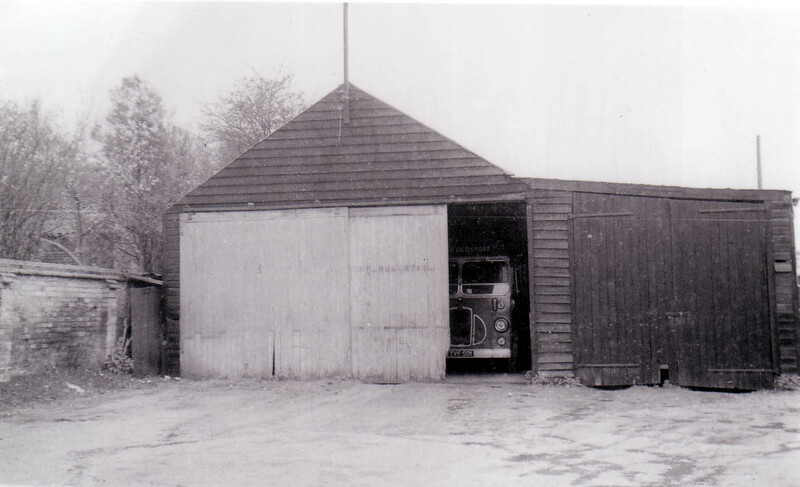 J L Brighton's Garage from 1 Aug 1930 to ??. 2. Shed in Swan Lane from ?? to ?? (pictured above). 3. 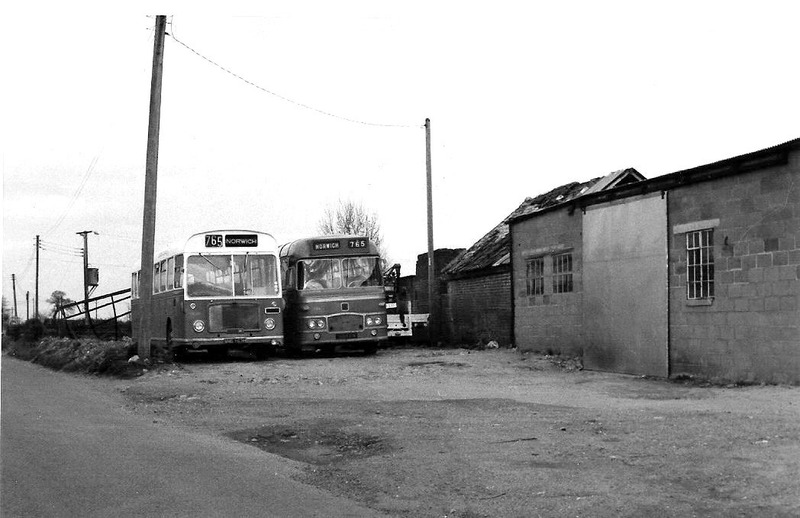 Open parking in Swan Lane (when shed was damaged by gales and later demolished in late 1976) from ?? 1976 to ?? 4. Angel PH, Norwich Road from ?? to ??. 5. Industrial Estate, Tharston Road from ?? Apr 1993 to 2 Jun 1996. 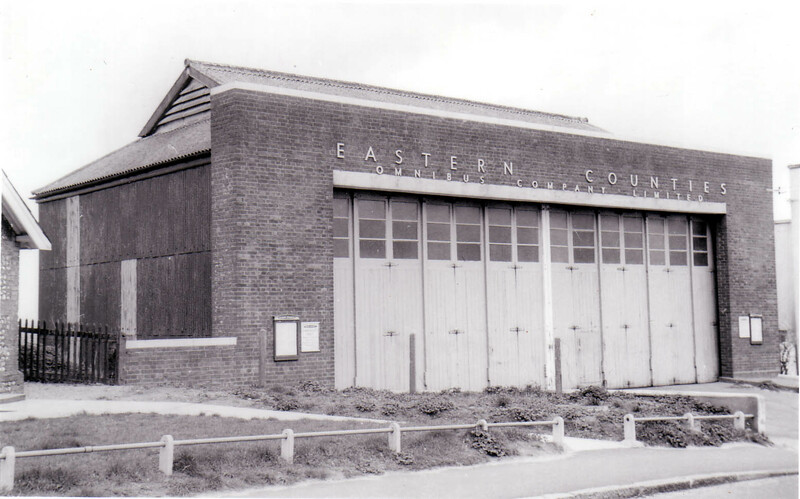 Opened by ECOC by 28 February 1960. Closed on 27 November 1982. Location: 1. 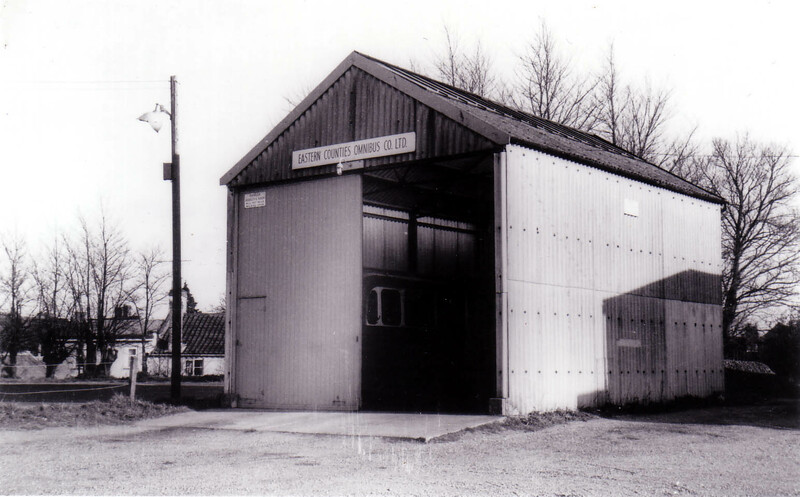 Under canopy of Bracey's Cold Store, Hemsby Road from 28 Feb 1960 to 27 Nov 1982. Opened by ECOC by 1 March 1959. Closed on 26 September 1976. Locations: 1. 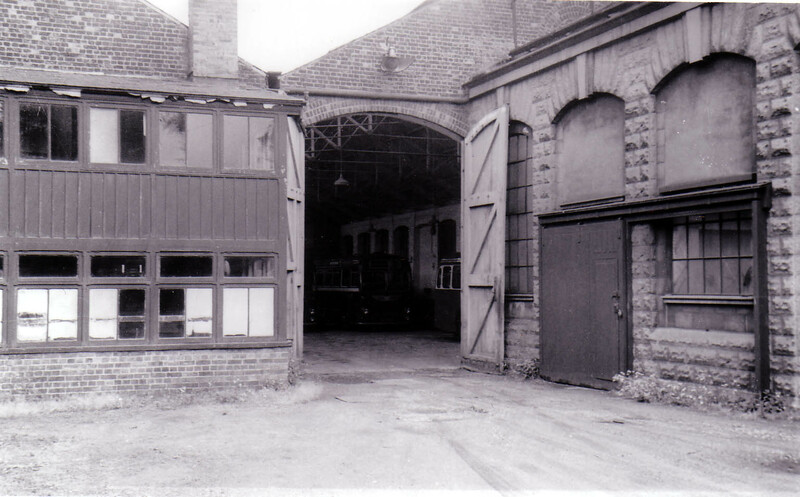 Old M&GN Carriage Works from 1 Mar 1959 to ?? 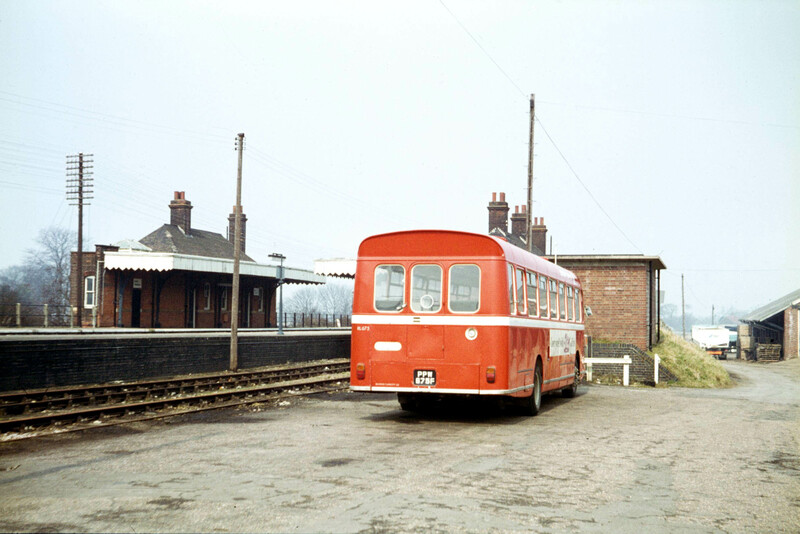 Dec 1966 (upon closure of M&GN Railway on 28 Feb 1959) (pictured above). 2. Open parking behind water tower on Hindolveston Road from ?? Dec 1966 to 26 Sep 1976. Opened by ECOC by ?? April 1934. Closed on 27 November 1982. Location: Garage, 14 Cromer Road from ?? Apr 1934 to 27 Nov 1982. Opened by United Automobile Services Ltd by 1 August 1930. Closed on 30 March 1985 (Duties transferred to Bunwell). Locations: 1. Shed, Chapel Street from 1 Aug 1930 to ?? (pictured above). 2. Open parking, Chapel Street from ?? to 30 Mar 1985. 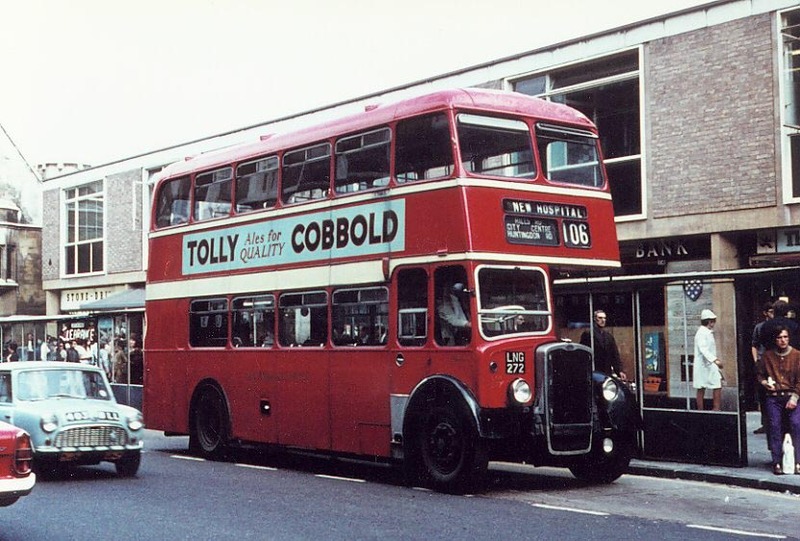 Opened by ECOC by 1 October 1959. Closed on 27 November 1982. Locations: 1. 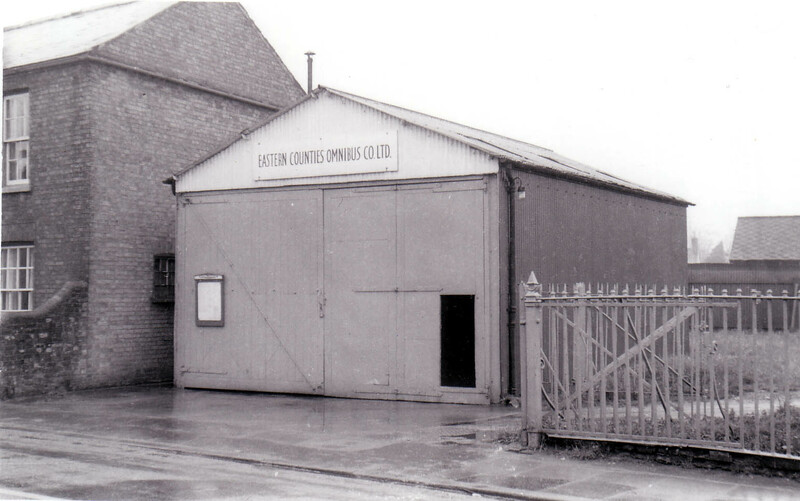 Shed belonging to Harmer & Scott, Norwich Road from 1 Oct 1959 to ?? (pictured above left). 2. Open parking at Railway Station from ?? to 27 Nov 1982 (pictured above right and bottom). Opened by ECOC on ?? 1934. Closed on ?? 1945. 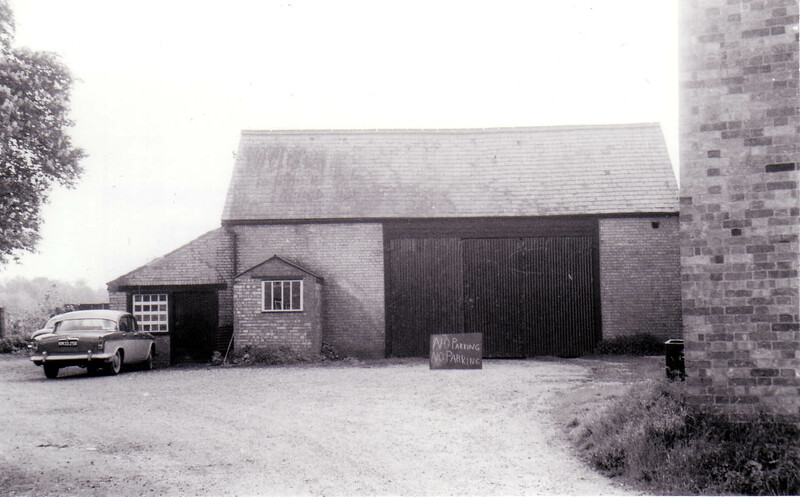 Location: Barn at A G Harris, Hall Farm, Lessingham Road from 1 Aug 1930 to 3 Jan 1981. Opened by United Automobile Services Ltd by 1 August 1930. Closed on 2 October 1993. Locations: 1. 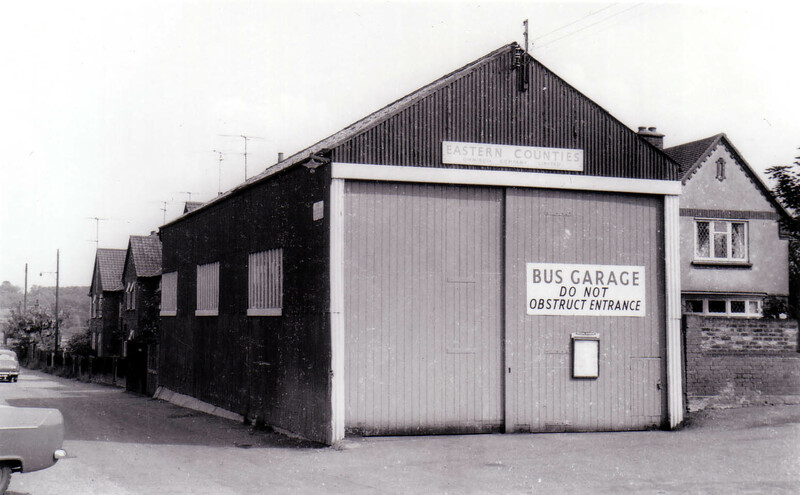 Garage, Station Road from 1 Aug 1930 to 25 Sep 1983 (pictured above). 2. Open parking on car park at junction of Covert Road and Jermyns Road, Reydon from 26 Sep 1983 to ?? Jul 1993. 3. Open parking on Pier coach and car park from ?? Jul 1993 to 2 Oct 1993. Opened by ECOC by ?? July 1936. Closed on ?? August 2004. Locations: 1. 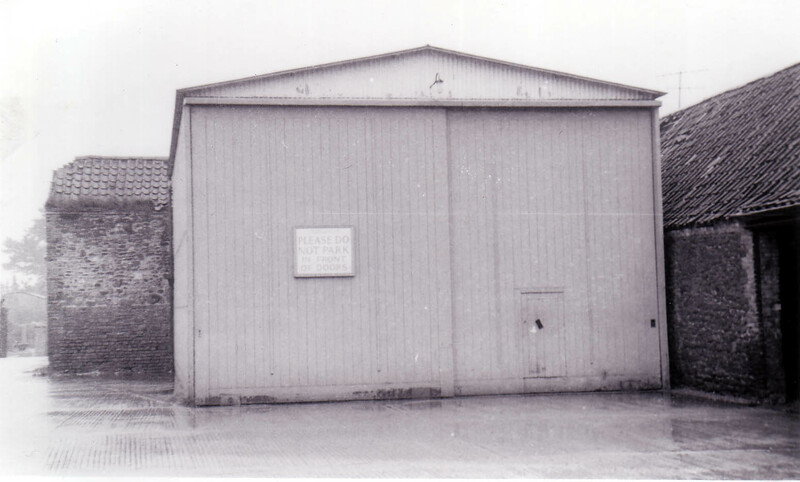 Company owned garage, St Giles Road from ?? Jul 1936 to ?? Apr 1959. 2. 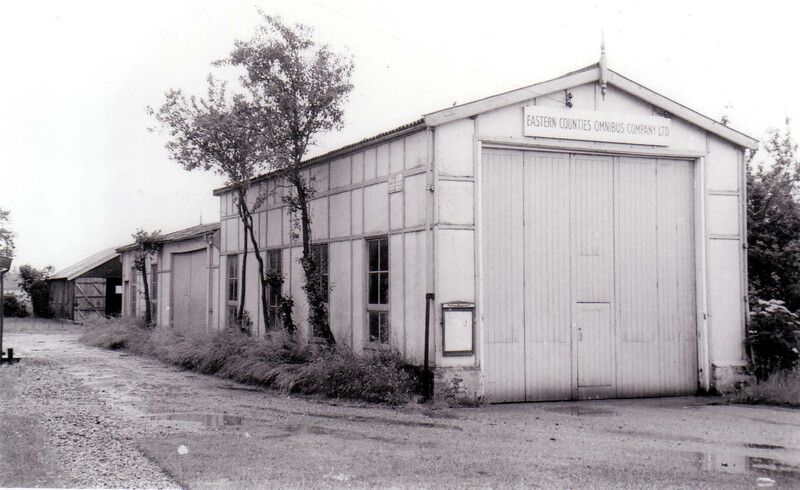 Former Robertsons shed and open parking ground, Brumstead Road from ?? Apr 1959 to ?? Mar 1981 (pictured above left). 3. Open parking in field off Walcott Road from ?? Mar 1981 to ?? Mar 1981 (pictured above right). 4. Burton's Millers, Staithe Road from ?? Mar 1981 to 24 Mar 1998. 5. 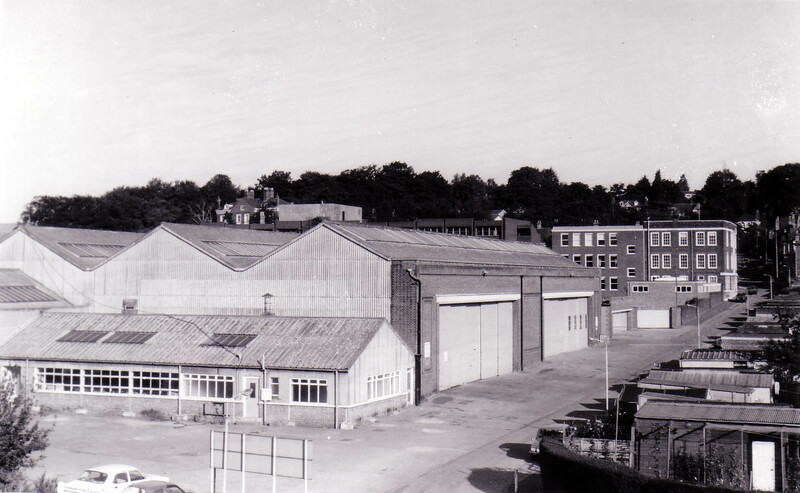 Open parking adjacent to Richardsons Shipyard, Staithe Road from 25 Mar 1998 to ?? Aug 2004. Opened by United Automobile Services Ltd by 1 August 1930. Closed on 4 September 1988. Locations: 1. Rear of 56, High Street from 1 Aug 1930 to ?? 1949. 2. 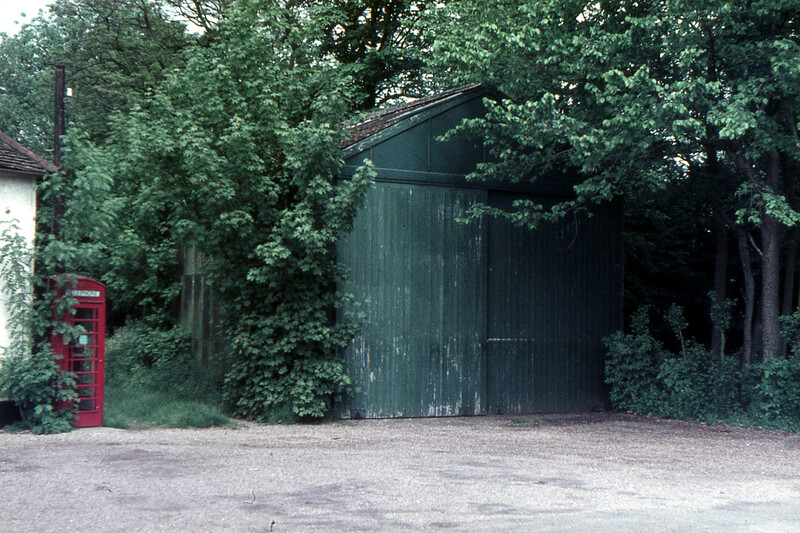 Shed in Old Green Man PH yard from ?? 1949 to ??. 3. Parking ground at Sale Yard, Norwich Road (owned by W S Hall & Palmer) from ?? to 4 Sep 1988 (pictured above). Opened by ECOC on 27 February 1983. Closed on 16 June 1985. 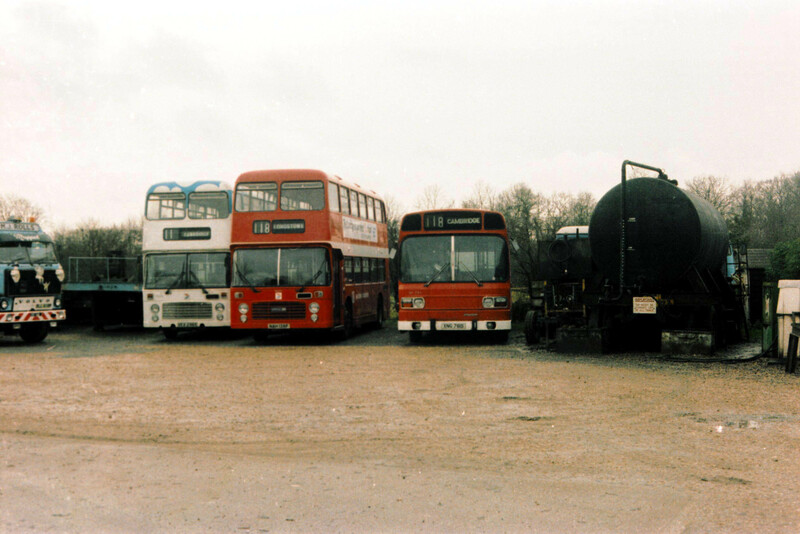 Location: Semmence Coaches yard at 34, Norwich Road from 27 Feb 1983 to 16 Jun 1985.
so the webmaster would be delighted to receive any contributions! 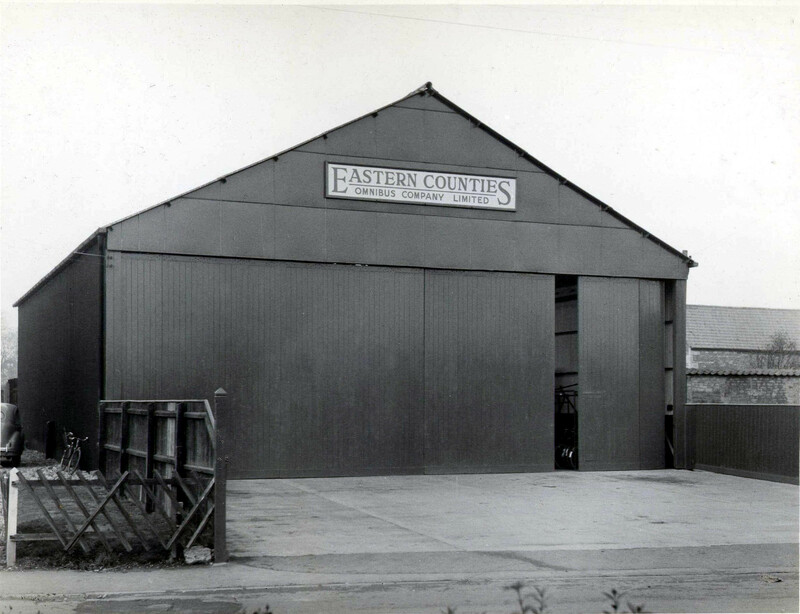 Opened by Eastern Counties Road Car Company Ltd by 1 August 1930. Closed on 15 November 1944 (Duties transferred to Colchester). Location: Near Crown Inn PH from 1 Aug 1930 to 15 Nov 1944. 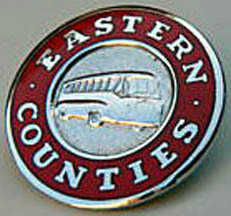 Opened by Eastern Counties Road Car Company Ltd by 1 August 1930. Closed on ?? September 1974. 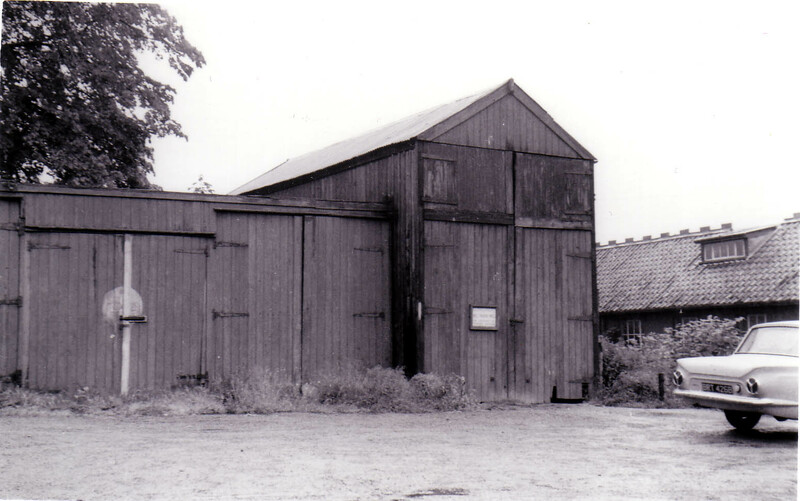 Location: Shed adjacent to Royal George PH, Stanton Road from 1 Aug 1930 to ?? Sep 1974. Opened by ECOC by ?? June 1975. Closed on 25 May 1986. Locations: 1. Open parking on hard-standing at Vicarage Farm, off Brockley Lane, Denham End from ?? Jun 1975 to ?? (pictured above). 2. Parking ground adjacent to a warehouse, off Denham Lane from ?? to 25 May 1986. 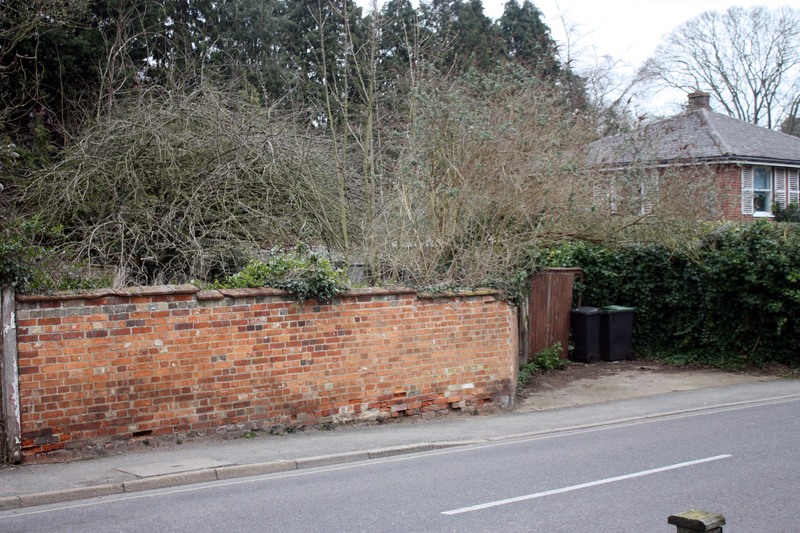 (This site is believed to be at a lay-by on Barrow Road, Denham End outside 'Denham Estate' (which has barns/warehouses). Presumably, the lay-by is a consequence of the main Barrow Road being straightened over time). 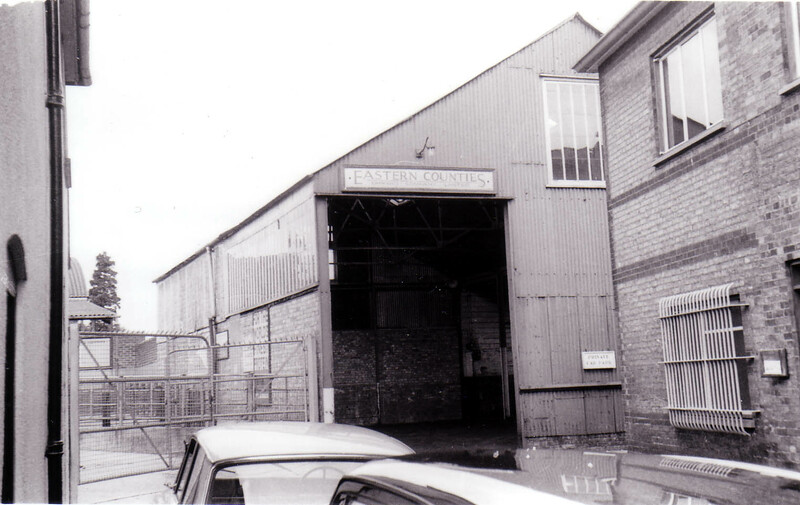 Opened by Eastern Counties Road Car Company Ltd by 1 August 1930. Closed on 5 June 1982. Location: On farm near church from 1 Aug 1930 to 5 Jun 1982. 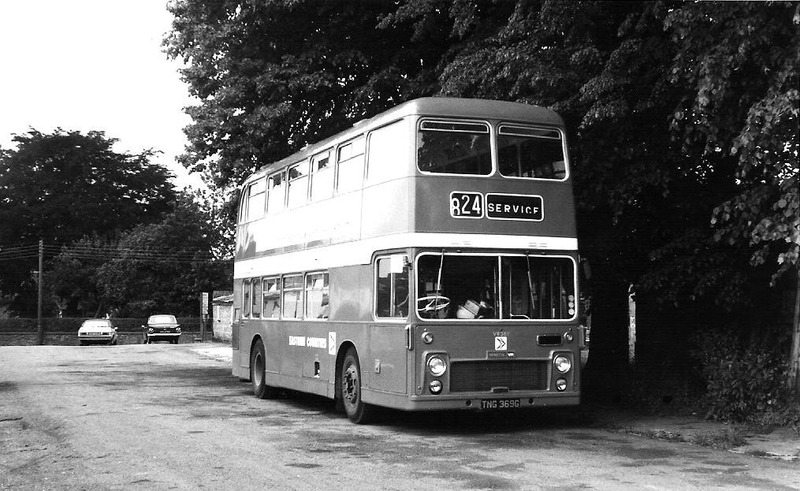 Re-opened on 1 May 1988 (upon acquisition of Bickers services). Closed on 28 Aug 2005. Locations: 1. Lodge Corner, Hollesley from 1 May 1988 to ?? Jul 1997. 2. On farm near church from ?? Jul 1997 to 28 Aug 2005. Location: Shed adjacent to Kings Head PH on A1101 from ?? Mar 1940 to ?? Jan 1973. Opened by ECOC by ?? 1935 (upon acquisition of Tom Skinner). Closed on ?? 1947. Opened by ECOC by ?? 1934 upon acquisition of Durrant (Boyton Beauty). Closed on ?? June 1962. 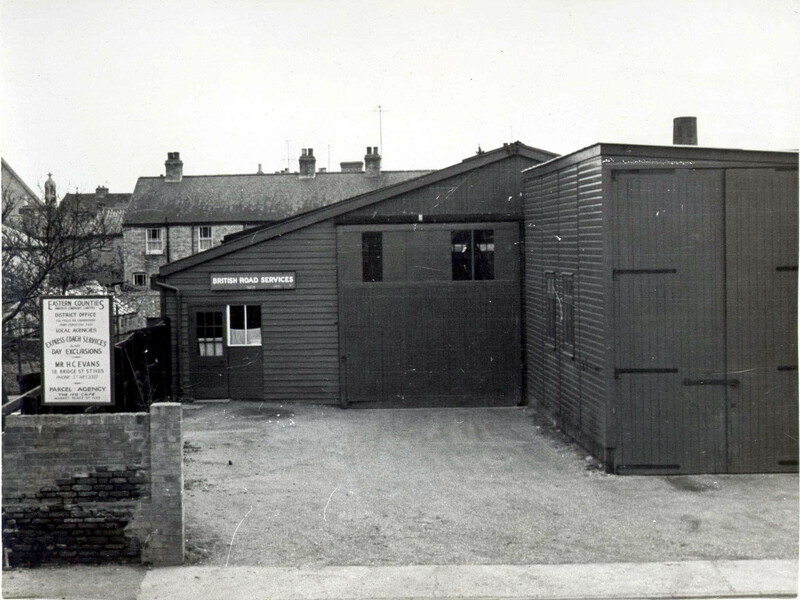 Location: Shed adjacent to Village Hall, The Street from ?? 1934 to ?? Jun 1962. Opened by Eastern Counties Road Car Company Ltd by 1 August 1930. Closed on ?? February 1973. Location: Shed at rear of Ram Hotel, High Street from 1 Aug 1930 to ?? Feb 1973. 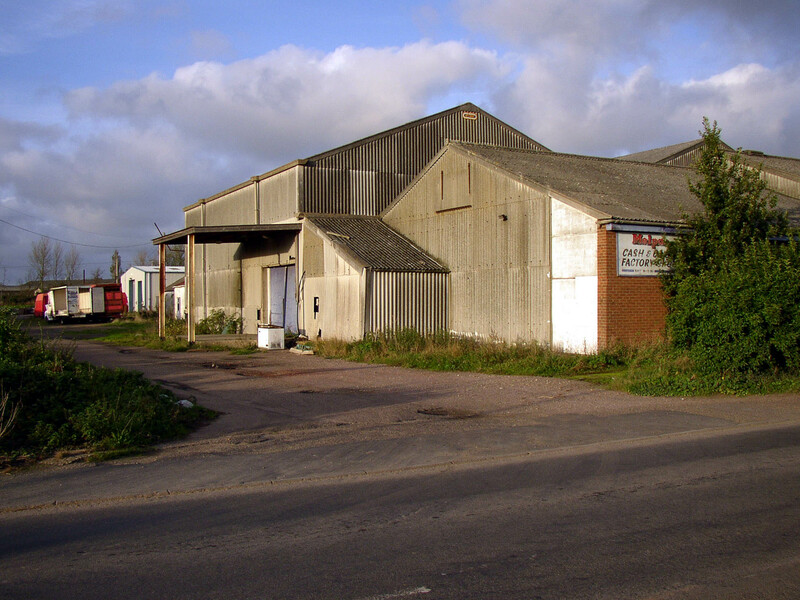 Location: Open parking at Bexford Plastics Ltd from 4 Jan 1981 to 11 Jun 1983. Opened by ECOC by ?? 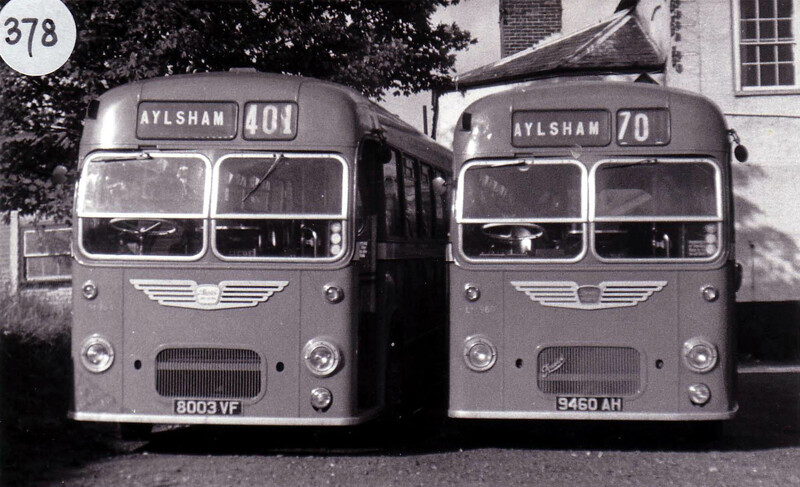 November 1944 (upon closure of Ardleigh). Closed on ?? June 1961. 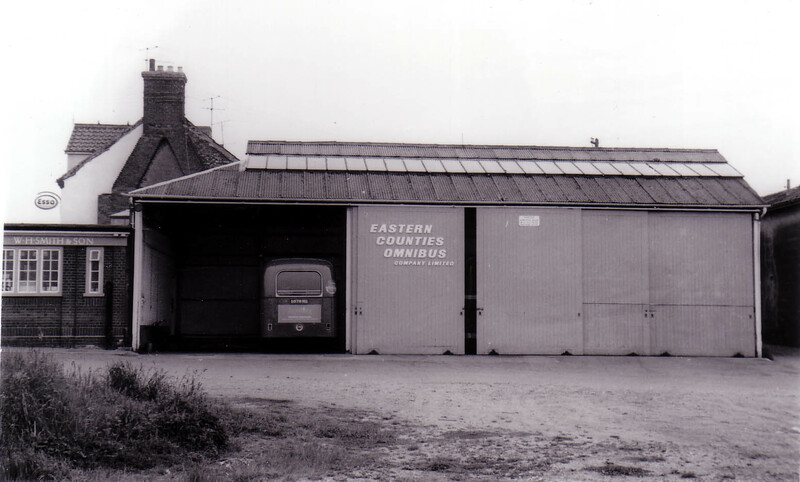 Location: Eastern National O C Depot from ?? Nov 1944 to ?? Jun 1961. Opened by Eastern Counties Road Car Company Ltd by 1 August 1930. Closed on 28 September 1974. Location: Open parking at Bus Station, Park Road from ?? Mar 1971 to 6 Sep 1986. 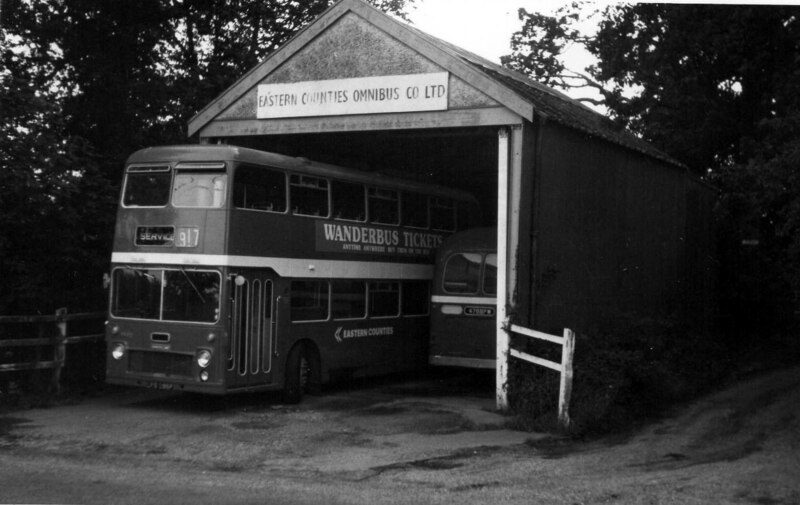 This site is still currently in use as the town's bus station. Opened by Eastern Counties Road Car Company Ltd by 1 August 1930. Closed on 24 October 1998. Locations: 1. 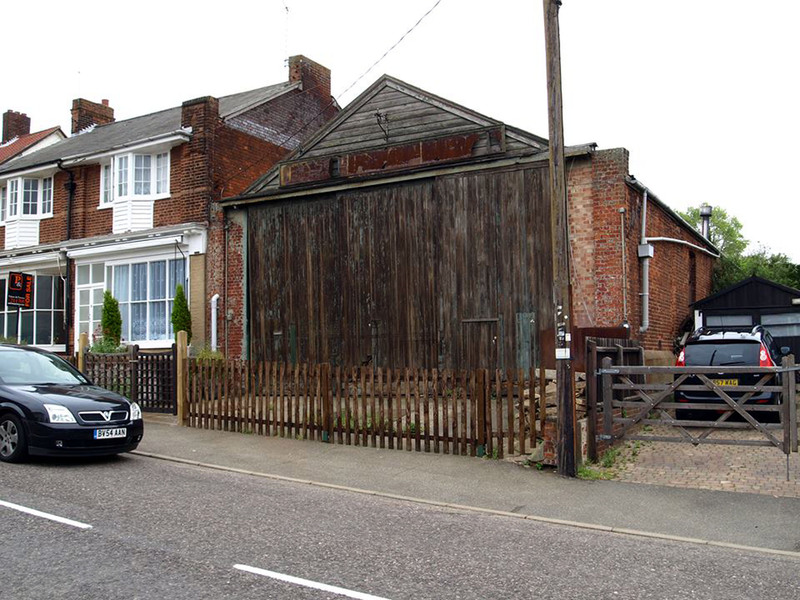 Shed adjacent to Red Lion PH, The Street from 1 Aug 1930 to ?? Jul 1951 (pictured below right). 2. 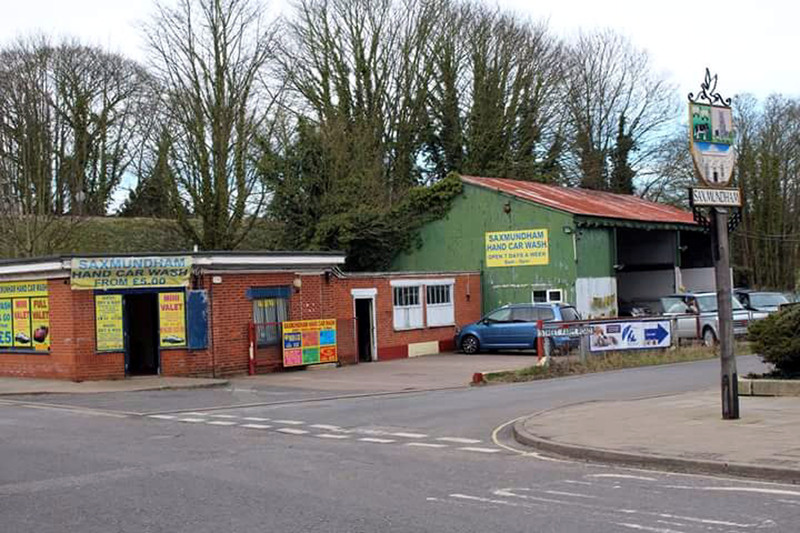 Two sheds and open parking adjacent to former Beeston's Garage, Heath Road from ?? 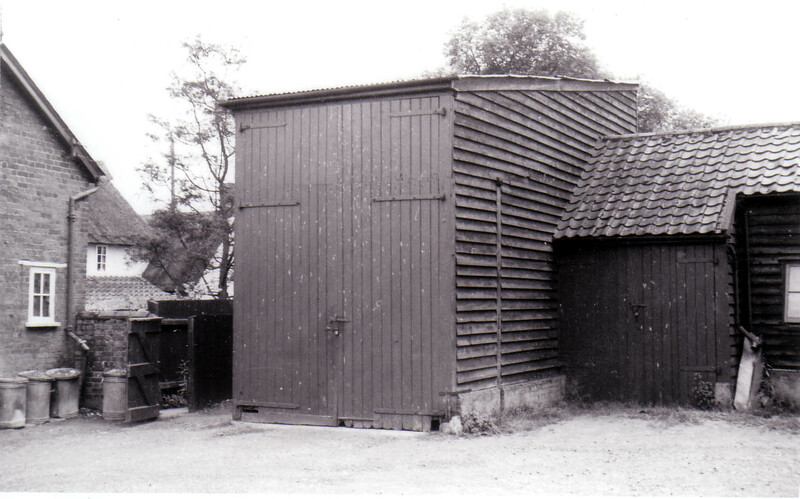 Jul 1951 to 3 Jan 1981 (rear shed pictured above left and front shed pictured above right and below left). 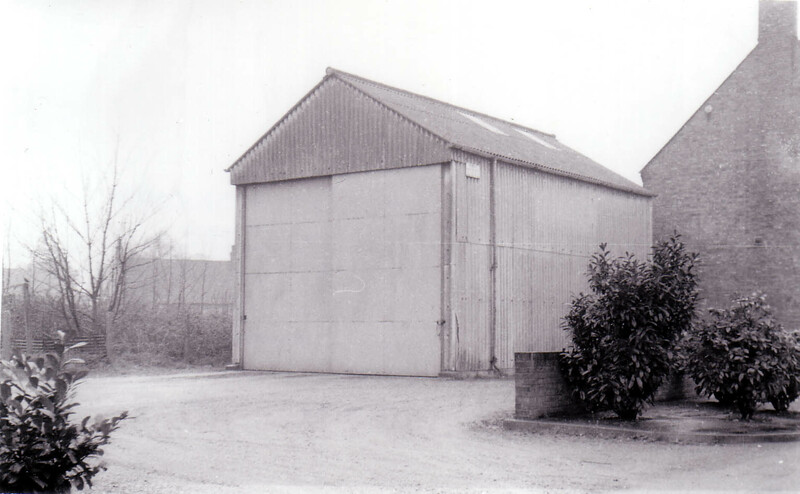 Garage sold by ECOC to Hamblion Transport (haulage contractor) on 3 Jan 1981 and operations were moved to Cattawade. 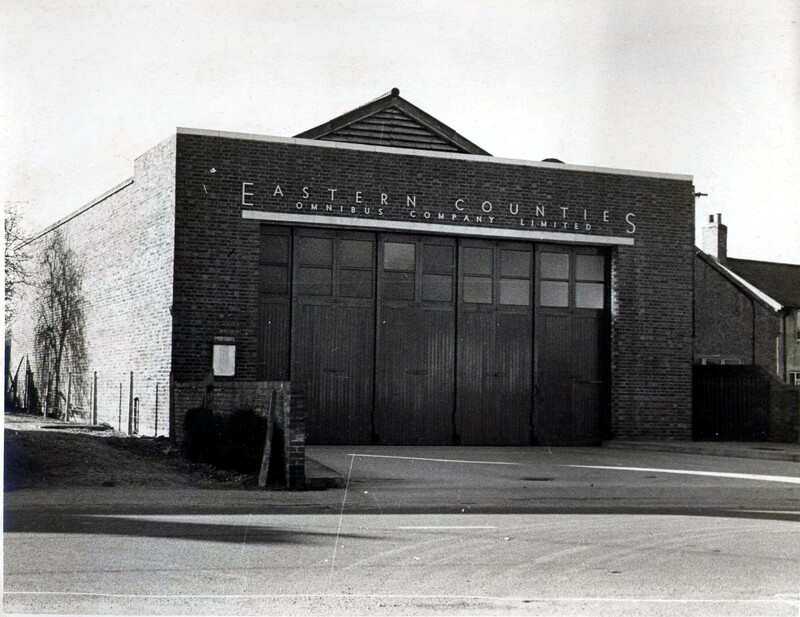 Re-opened as open parking on the forecourt of the former garage on 12 Jun 1983 upon closure of Cattawade. Closed on 11 Aug 1988 and redeveloped for housing. 3. Yard of G B Beeston, (haulage contractors) from 12 Aug 1988 to 24 Oct 1998. 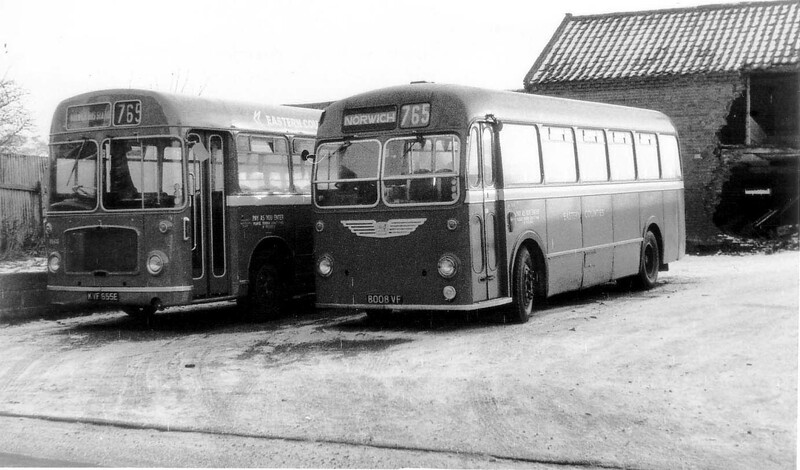 (This was the same Beeston family that sold their bus business to ECOC in July 1951). 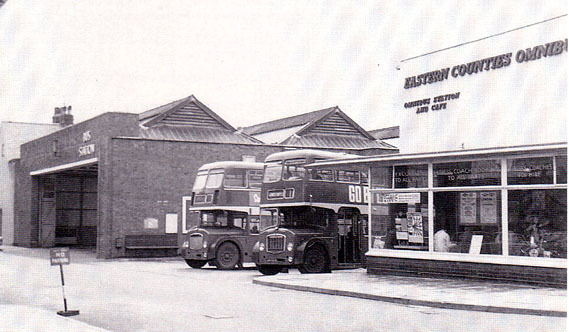 The Beeston family retired from the haulage business and the site was sold for a housing development in 1999 or 2000. Location: Shed in Castle Street (No. 31) from 1 Aug 1930 to ?? Mar 1971. Bottom picture shows the site in Jun 2016. Opened by Eastern Counties Road Car Company Ltd by 1 August 1930. Closed on 28 August 2005. Location: Shed at 68 Station Road from 1 Aug 1930 to 28 Aug 2005. Opened by ECOC by 3 September 1985. Closed on 27 May 1986. 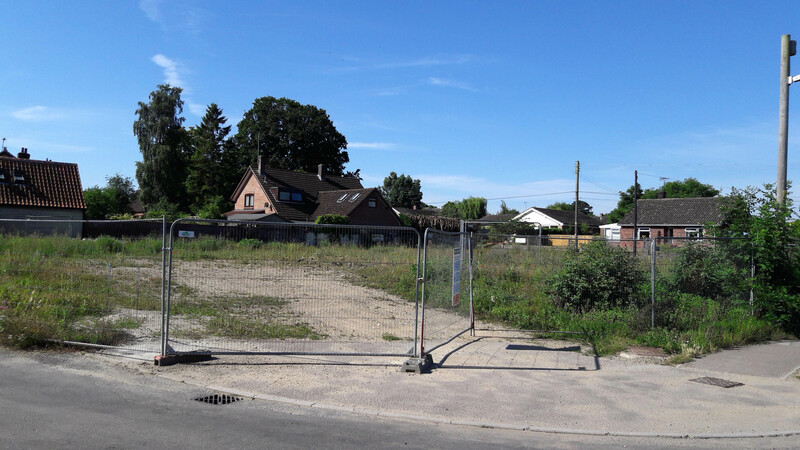 Location: Open parking next to playing field, Mellis Road from 3 Sep 1985 to 27 May 1986. 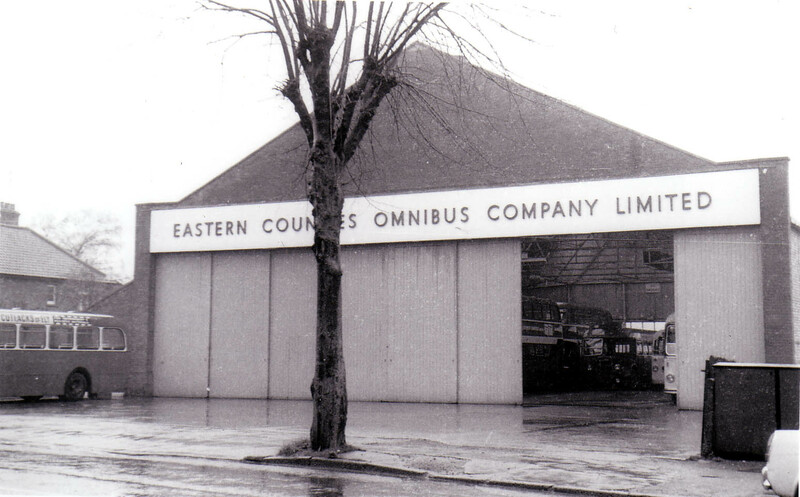 Opened by Eastern Counties Road Car Company Ltd by 1 August 1930. Closed on 19 February 1983. 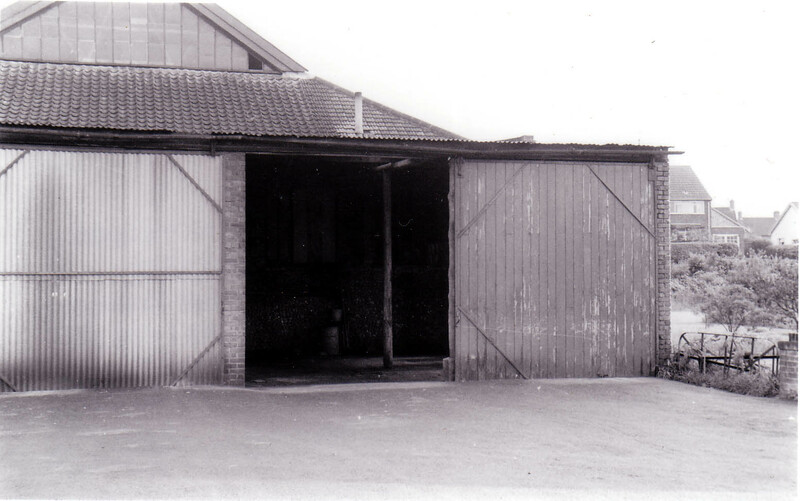 Location: Shed in Calais Street from 1 Aug 1930 to 19 Feb 1983. Shed was demolished in Dec 1993. Opened by ECOC by 8 September 1986. Closed on 2 September 1991. 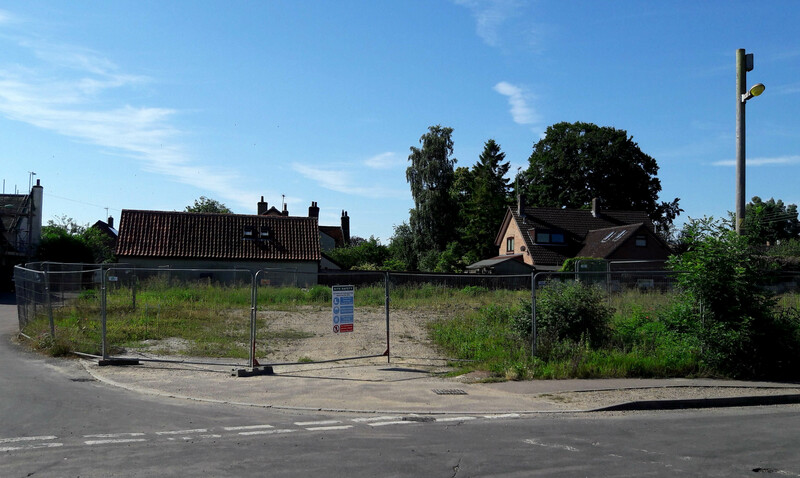 Location: Open parking at Hoxne Grain & Seed Ltd, Abbey Farm from 8 Sep 1986 to 2 Sep 1991. Opened by ECOC by ?? March 1939. Closed on ?? January 1973 (Duties transferred to Mildenhall). Location: Shed at rear of Bell Hotel from ?? Mar 1939 to ?? Jan 1973. Opened by ECOC on ?? January 1973. Closed on 10 April 1999. Locations: 1. Open parking at King Street car park from ?? Jan 1973 to ?? Mar 1976. 2. Kirby Pharmaceuticals car park on industrial estate on Chiswick Avenue from ?? Mar 1976 to ?? Aug 1982. 3. Small public car park on industrial estate on the corner of Chiswick Avenue and Hampstead Avenue from ?? Aug 1982 to ?? 1986 (pictured above). 4. Kerbside parking on Hampstead Avenue from ?? 1986 to ?? Oct 1986. 5. Parking area adjacent to industrial units on the corner of Hampstead Avenue and Leyton Avenue from ?? Oct 1986 to ?? Nov 1989. 6. Open parking at farm at Hurdle Drove between Beck Row and West Row from ?? Nov 1989 to ?? Dec 1995. 7. P & F Safepac, Fred Dannatt Road from ?? Dec 1995 to 10 Apr 1999. Opened by Eastern Counties Road Car Company Ltd by 1 August 1930. Closed on ?? July 1951 (Duties transferred to East Bergholt). 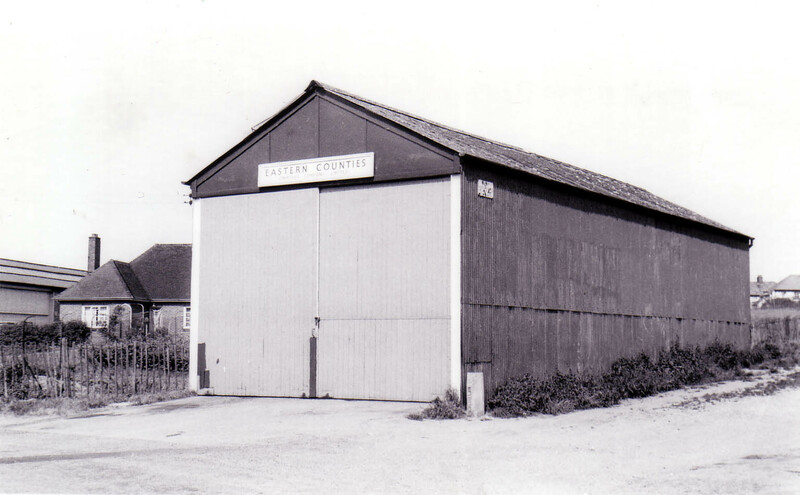 Location: Shed in Station Road, Manningtree from 1 Aug 1930 to ?? Jul 1951. Opened by Eastern Counties Road Car Company Ltd by 1 August 1930. Closed on ?? 1952 (Destroyed by gales in November 1963). Location: Shed at rear of Jolly Sailor PH from 1 Aug 1930 to ?? 1952. Opened by ECOC on 4 September 1988. Closed on 1 June 1997. 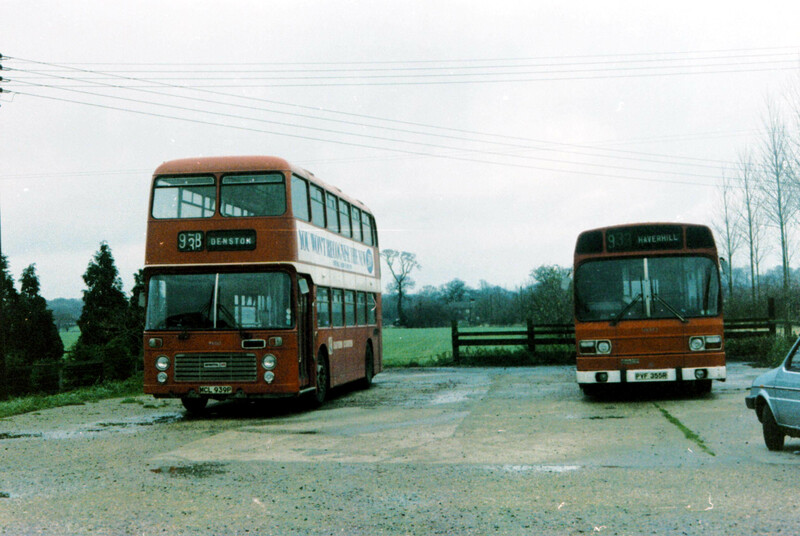 Location: c/o Bury St Edmunds Depot, Cotton Lane from 4 Sep 1988 to 1 Jun 1997. 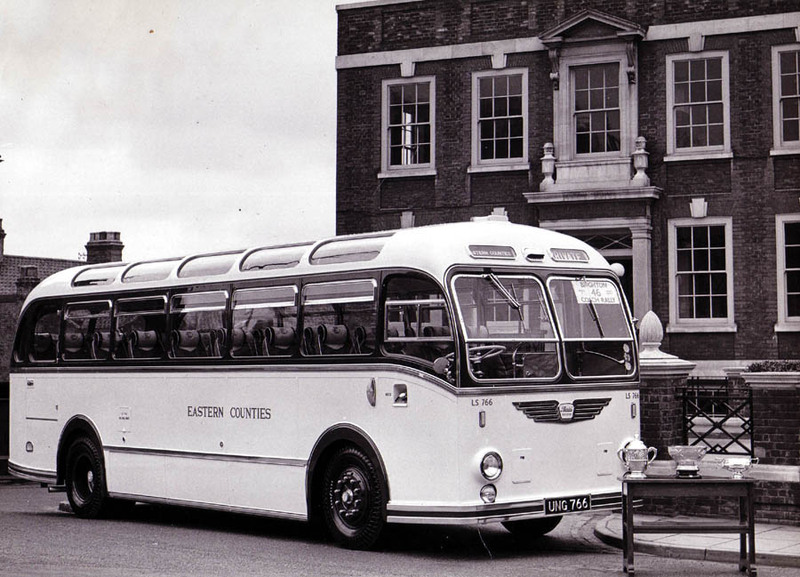 Opened by Eastern Counties Road Car Company Ltd by 1 August 1930. Closed on ?? 1947. Locations: 1. Bristol Arms PH from 1 Aug 1930 to ?? 1932. 2. Shed in Bristol Hill from ?? 1932 to ?? 1947 (pictured above). 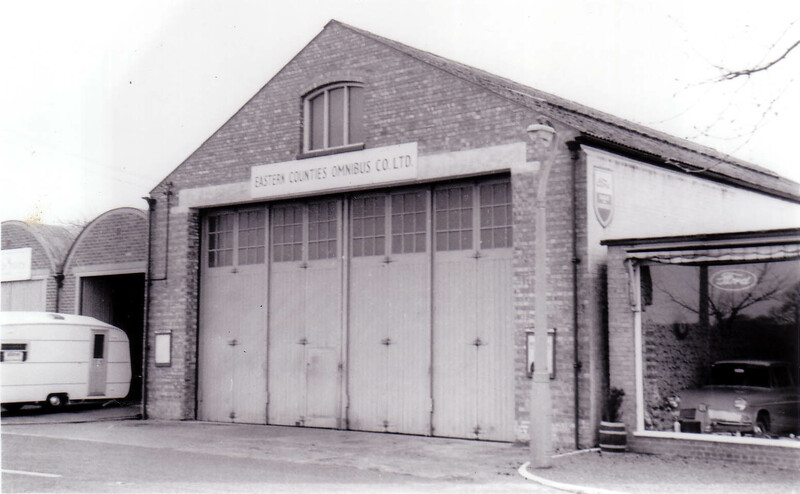 Opened by Eastern Counties Road Car Company Ltd by 1 August 1930. Closed on 30 September 2006. Locations: 1. Shed in Old George Yard, Crowe Street, off Market Place from 1 Aug 1930 to ?? Oct 1971 (pictured above). 2. Parking ground at Railway Station from ?? Oct 1971 to ?? Jun 1997. 3. Ro-Trucks Ltd Scania dealers, Violet Hill Road from ?? Jun 1997 to 30 Sep 2006. 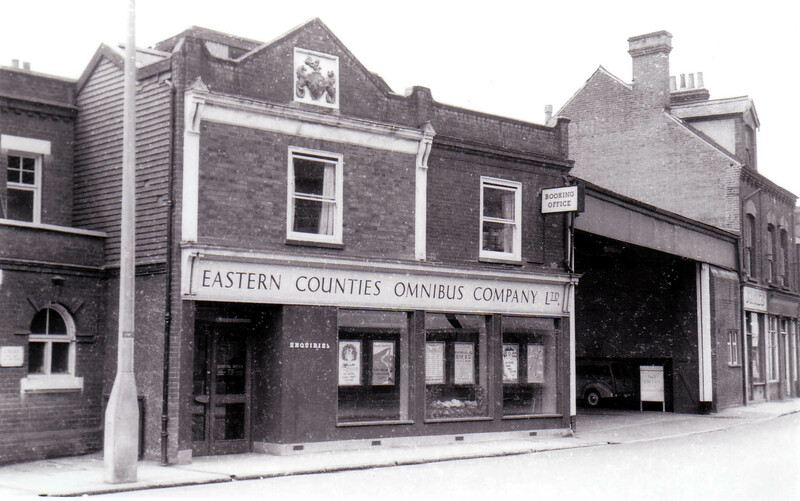 Opened by Eastern Counties Road Car Company Ltd by 1 August 1930. Closed on 20 November 1983. 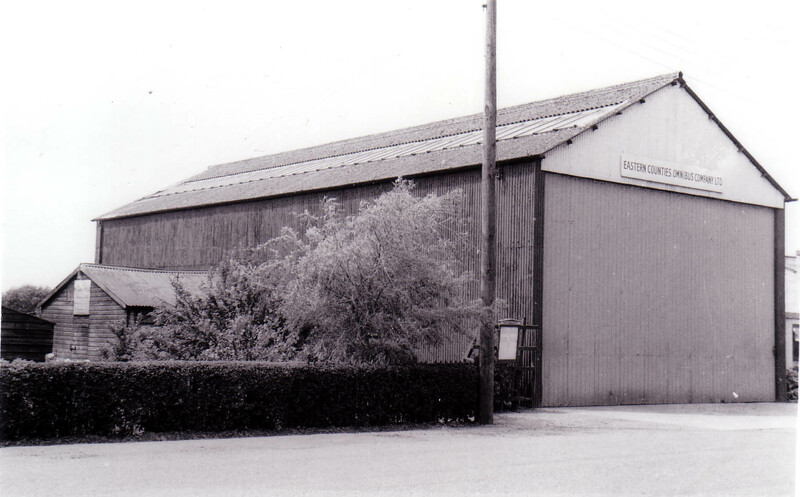 Location: Shed in Wilby Road from 1 Aug 1930 to 20 Nov 1983. Opened by Eastern Counties Road Car Company Ltd by 1 August 1930. Closed on 23 July 2001. Locations: 1. Shed at rear of Hound PH from 1 Aug 1930 to ?? Sep 1972 (pictured top left). 2. Layby off A143 at Wickhambrook from ?? Sep 1972 to ?? Dec 1981 (pictured top right). 3. Open parking at Howe's Farm, Stradishall from ?? Dec 1981 to 23 Jul 2001 (pictured bottom). Locations: 1. Shed in Burkett's Lane by 1 Aug 1930 to ?? Mar 1982 (pictured above). 2. Open parking at HGV park near Railway Station from ?? Mar 1982 to ?? Mar 1989. 3. Lucas CAV works, Newton Road from ?? Mar 1989 to ?? Sep 1991. 4. 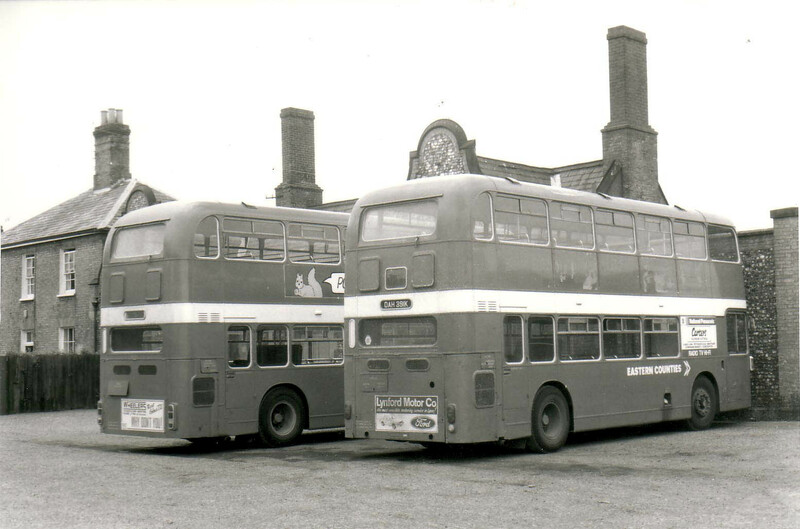 Beeston's Coaches, Long Melford from ?? Sep 1991 to ?? Sep 1993. 5. 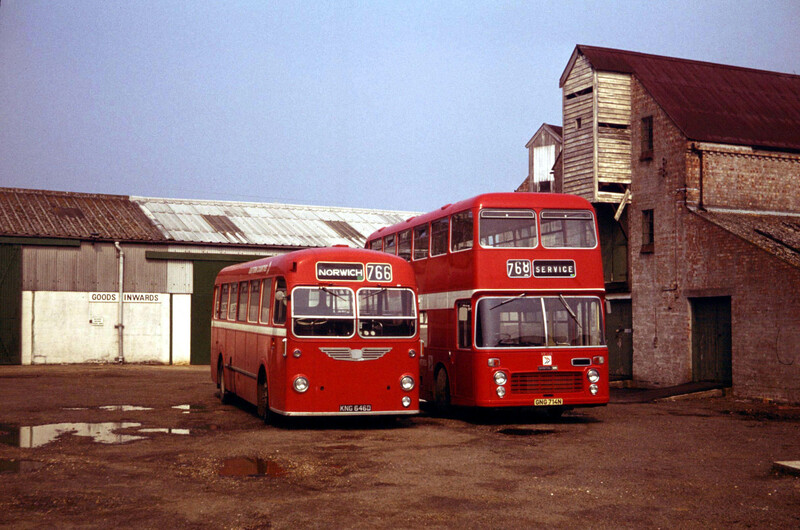 Shawlands Warehouse from ?? Sep 1993 to ?? Jan 1996. 6. 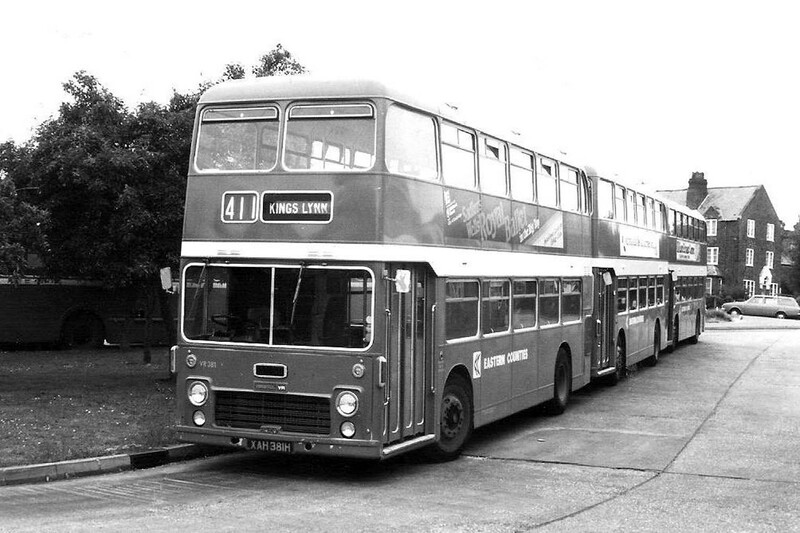 Hedingham Omnibuses, Meekings Road from ?? Jan 1996 to 28 Aug 2005. Opened by Eastern Counties Road Car Company Ltd by 1 August 1930. Closed on 29 August 2004. Locations: 1. Unknown location from 1 Aug 1930 to 10 Feb 1959. 2. 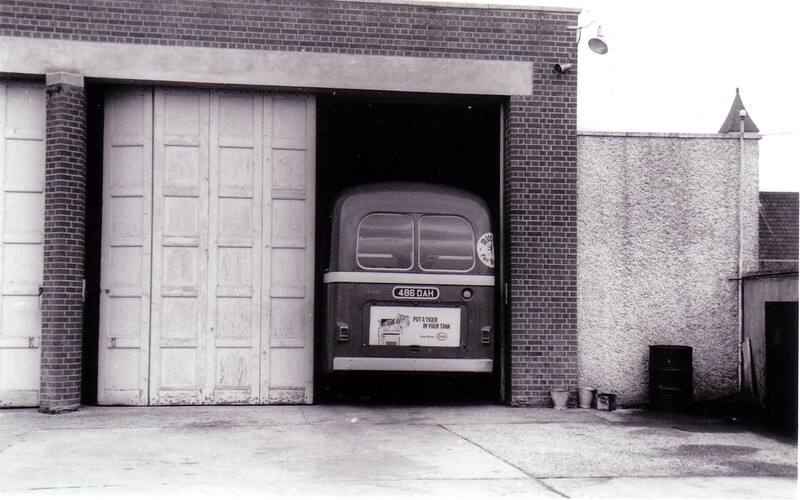 Garage at 21, Old Market Street from 10 Feb 1959 to ?? Sep 1983 (pictured above). 3. 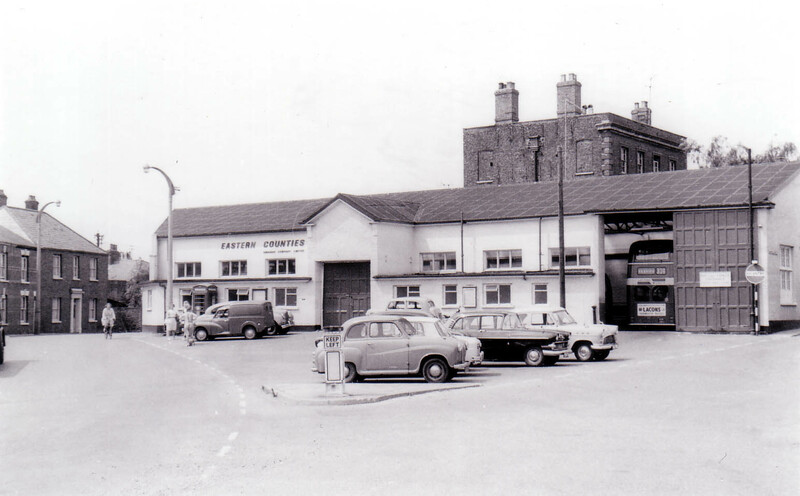 Railway Station goods yard from ?? Sep 1983 to ?? 4. Blakeney Farm, Croxton Road from ?? 1989 to 1 Sep 1998. 5. Secure parking on Croxton Road Industrial Estate from 1 Sep 1998 to ?? Sep 2002. 6. Compound at 16a, Roman Way, Fison Way Industrial Estate from ?? Sep 2002 to 29 Aug 2004. Opened by Eastern Counties Road Car Company Ltd by 1 August 1930. Closed on 30 April 1989 (Shed demolished by ?? April 2006). Locations: 1. Thought to have been at the Blue Boar PH by 1 Aug 1930 to ?? 1932. 2. Shed in Hepworth Road from ?? 1932 to 30 Apr 1989 (pictured above). Opened by Eastern Counties Road Car Company Ltd by 1 August 1930. Closed on ?? July 1997. Locations: 1. 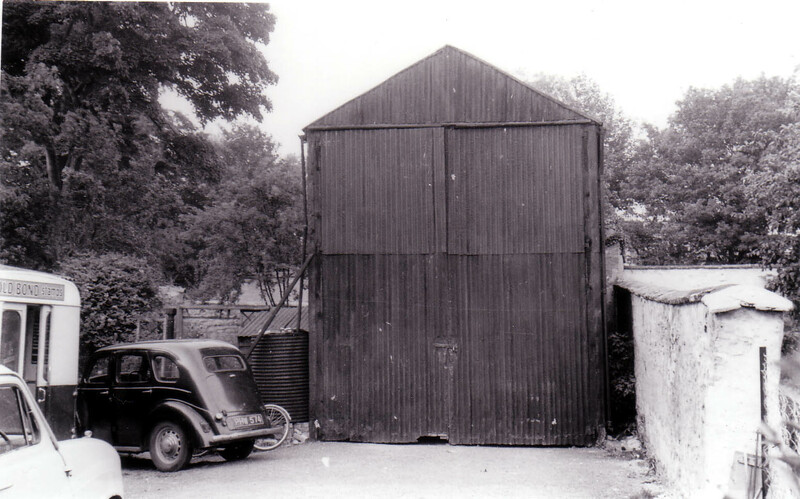 Shed in Limekiln Quay Road from 1 Aug 1930 to ?? 1976 (pictured above). Shed was demolished in ?? 1976. 2. Open parking in Railway Station yard from ?? 1976 to ?? Jul 1997. Opened by Ortona Motor Company Limited by 1 August 1930. Closed on ?? July 1954. 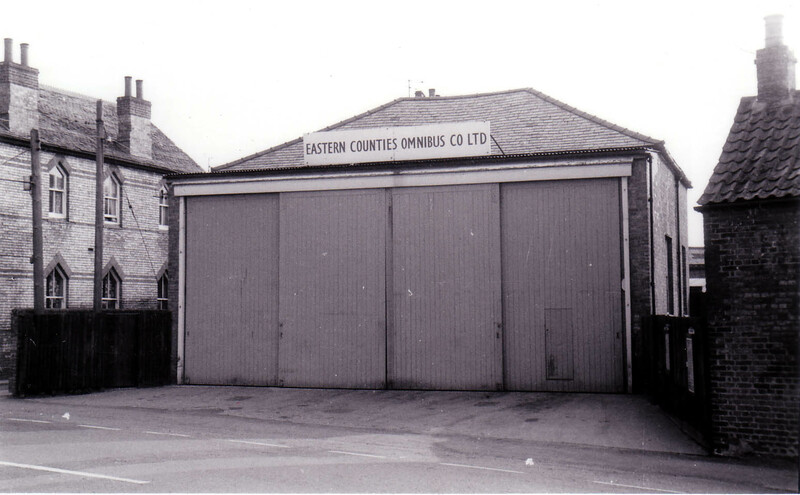 Opened jointly by Eastern Counties Road Car Company Ltd and Ortona Motor Company Limited by 1 August 1930. Closed on 23 January 1972. 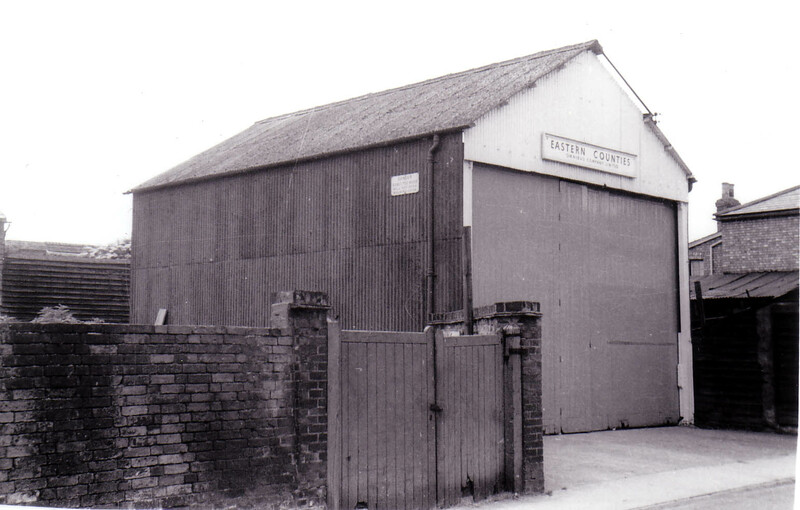 Location: Shed in High Street from 1 Aug 1930 to 23 Jan 1972 (pictured above). 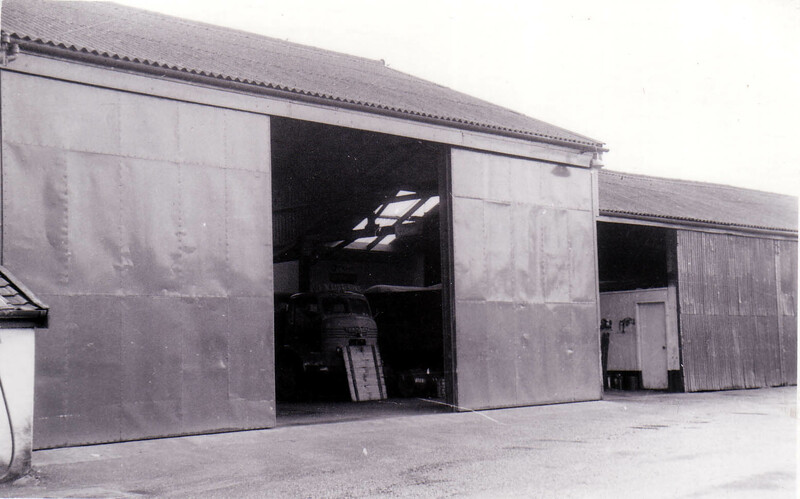 Re-opened upon acquisition of Burwell & District Motor Services Ltd on 10 June 1979. Closed ?? Jan 1985. 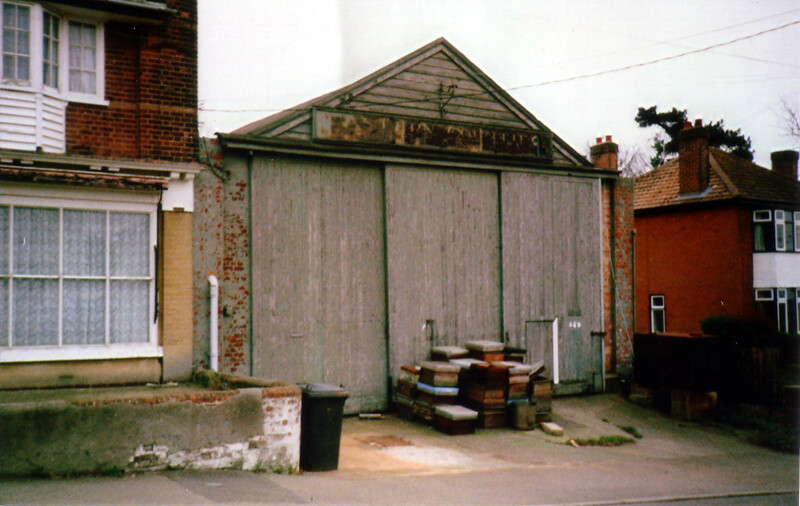 Location: Garage in High Street from 10 Jun 1979 to ?? Jan 1985. Opened by Ortona Motor Company Limited by 1 August 1930. Closed on ?? 1951 (Duties transferred to Longstowe). Opened by Ortona Motor Company Limited by 1 August 1930. Closed on 9 September 1984 (Transferred to Cambus). Locations: 1. Two sheds at 39, High Street from 1 Aug 1930 to ?? Sep 1983 (pictured above). 2. Cambs County Council Highways Depot, Twentypence Road from ?? Sep 1983 to 9 Sep 1984. Opened by ECOC by ?? 1938. Closed on ?? 1945. 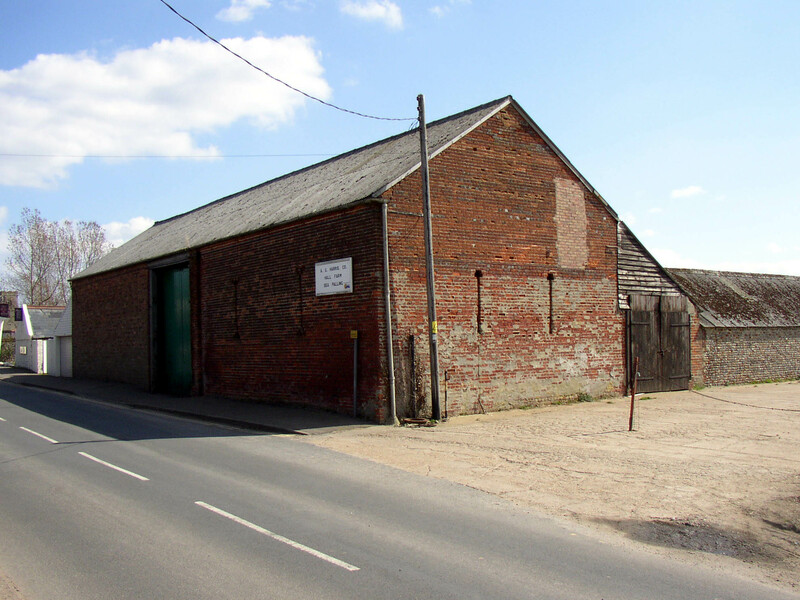 Location: Barn at Kingcroft, High Street (rented from A V Wordsell & Son) from ?? 1938 to ?? 1945. Opened by ECOC by ?? 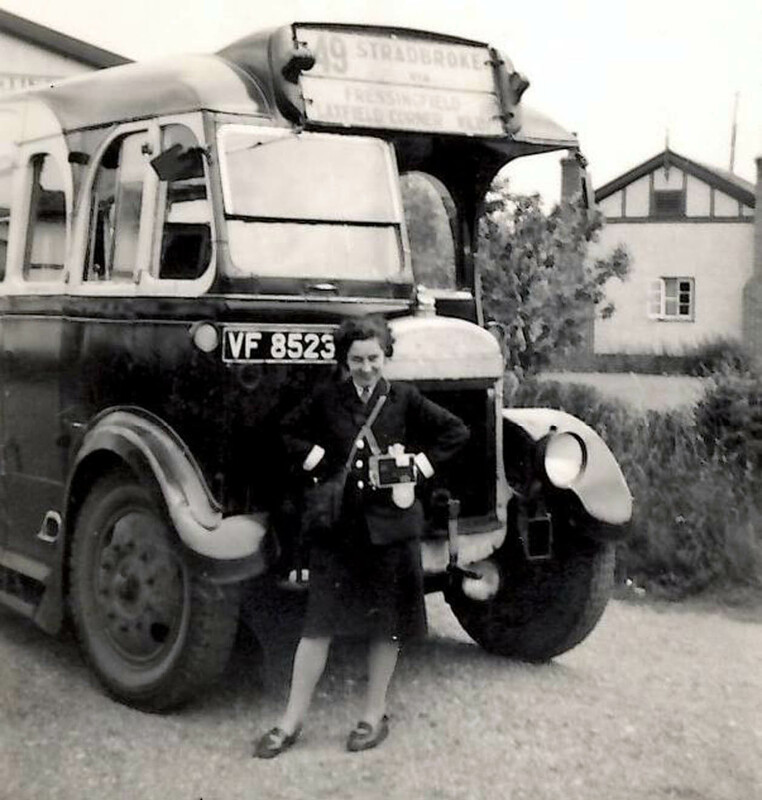 September 1944 (upon acquisition of Barker's Bus Services Ltd (Fenstanton & District). Closed on ?? 1956. Location: Chequer Street, by Chequer Close from ?? Sep 1944 to ?? 1956. Opened by ECOC on 6 June 1982. Closed on 9 September 1984 (Transferred to Cambus). Location: Parking ground at Little Chef car park, off A45 from 6 Jun 1982 to 9 Sep 1984. Locations: 1. Unknown location from 1 Aug 1930 to ?? 1944. 2. Garage in Camps Road from ?? 1944 to ?? 1976 (pictured above). 3. Open parking at Burtons Coaches, Duddery Hill from ?? 1976 to 9 Sep 1984. Opened by ECOC on ?? June 1936. Closed on ?? 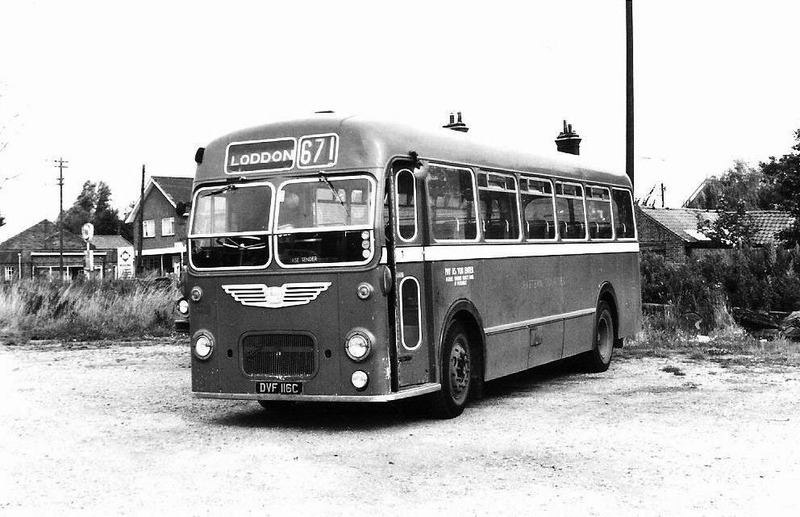 April 1964 (Duties transferred to Saffron Walden). Location: Shed in New Road from ?? Jun 1936 to ?? Apr 1964. Opened by Ortona Motor Company Limited by 1 August 1930. Closed on ?? 1946. Re-opened on 6 June 1982. Closed on ?? 1989. 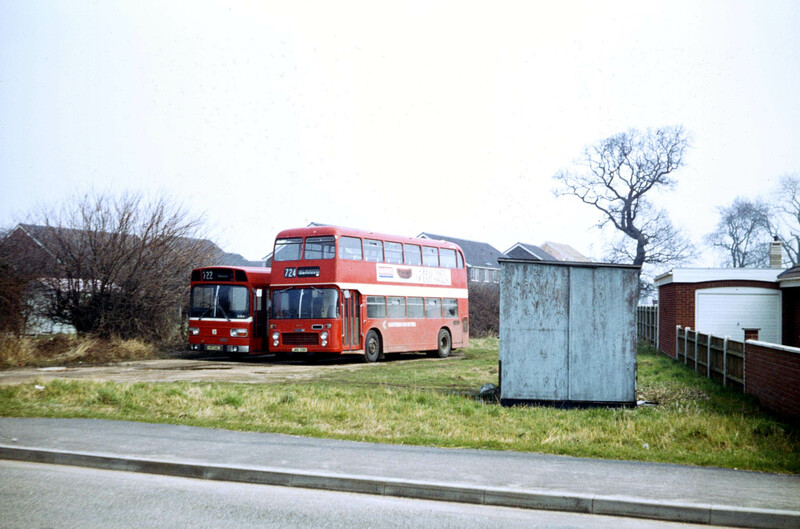 Location: W P A Ltd, near old railway station (off A604) from 6 Jun 1982 to ?? 1989. Opened by ECOC on 3 January 1982. Closed on ?? 1989. 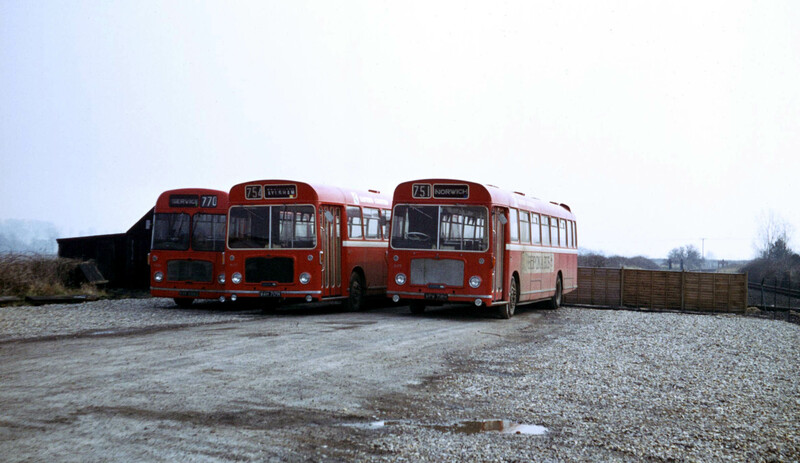 Location: Parking ground in farmyard on South Street (one way system) off A505 from 3 Jan 1982 to ?? 1989. Opened by ECOC by ?? January 1938 (upon acquisition of Washington). Closed on 23 January 1972. Location: Sheds at 100-102 Victoria Street from ?? Jan 1938 to 23 Jan 1972. Opened by ECOC by ?? 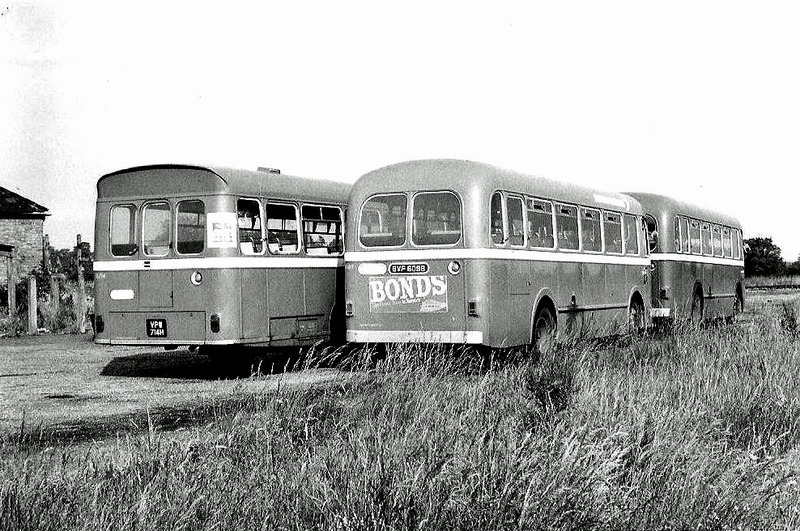 1951 (upon closure of Caxton). 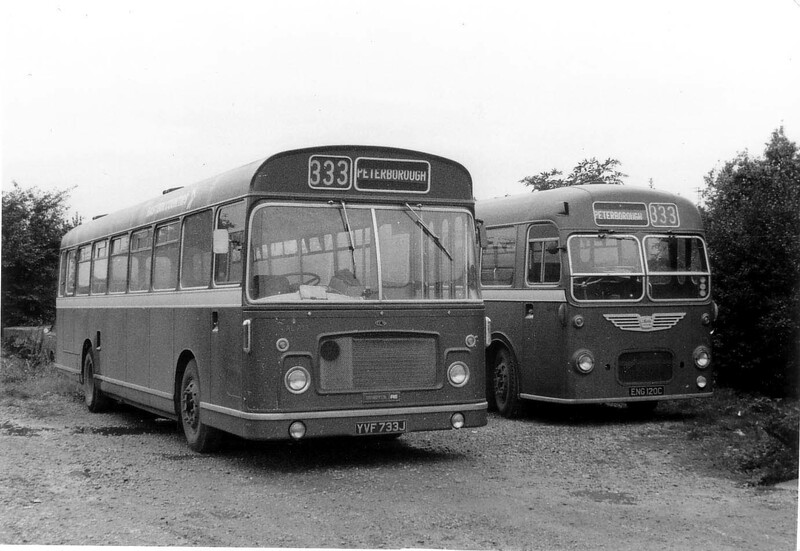 Closed on 9 September 1984 (Transferred to Cambus). Locations: 1. Fox PH from ?? 1951 to ?? 2. 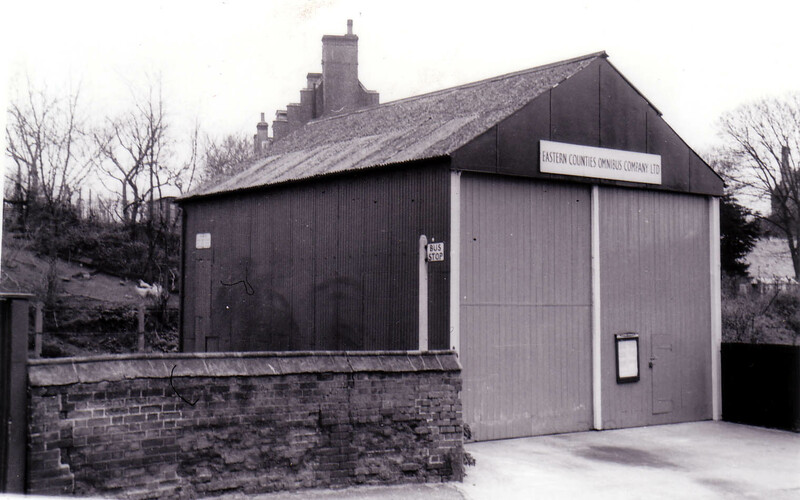 Piper's Garage near old North Road Station from ?? to ?? 1980. 3. 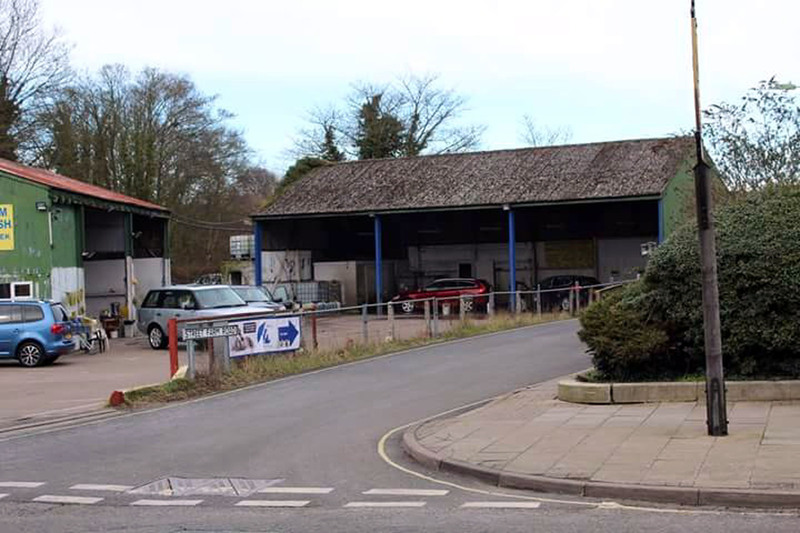 Open parking at M J Rolls (haulage contractor), Fox Road, Bourne (B1046) from ?? 1980 to 9 Sep 1984 (pictured above). Locations: 1. Unknown from 1 Aug 1930 to ?? 1949. 2. 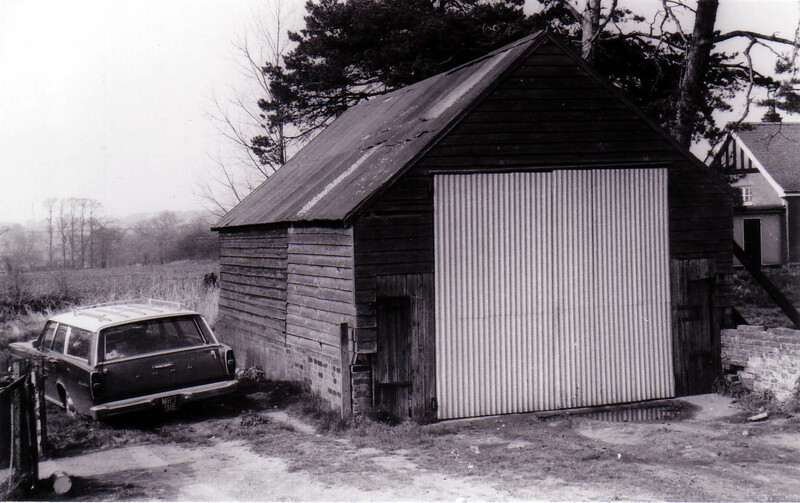 Barn at rear of Green Man PH from ?? 1949 to ?? 1957. 3. North Herts County Council car park, Baldock Road from ?? 1957 to ?? 1966. 4. Open parking in bus station, Barkway Street (A10) from ?? 1966 to ?? 5. Open parking at Bury Lane Fruit Farm car park on A10 Melbourn by-pass from ?? to 9 Sep 1984. Opened by ECOC on ?? 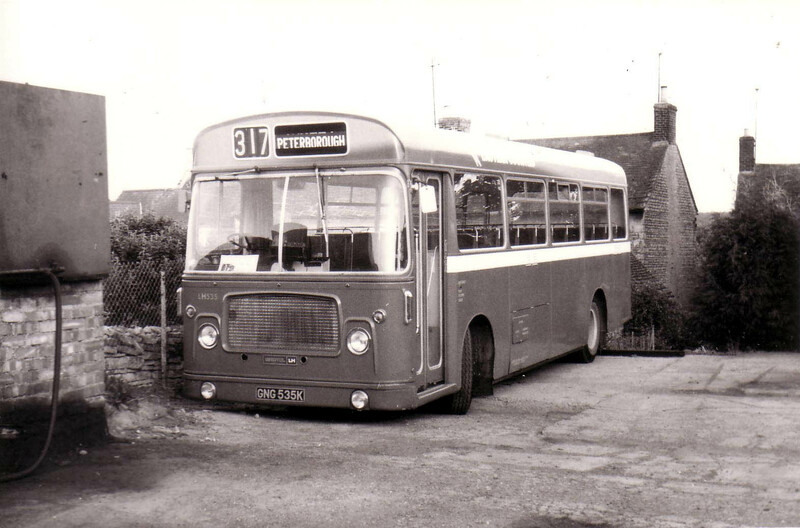 September 1964 (upon closure of Hinxton). Closed on 9 September 1984 (Transferred to Cambus). Locations: 1. Railway Station yard from ?? Sep 1964 to ?? 1975. 2. Parking ground adjacent to Siaco premises in Radwinter Road (B1053) from ?? 1975 to 9 Sep 1984. Opened by ECOC by ?? June 1936. Closed on 3 January 1971. Locations: 1. North Road from ?? Jun 1936 to ?? Mar 1937. 2. Shed in Station Road from ?? Mar 1937 to 3 Jan 1971 (pictured above). Re-opened on 25 November 1979. Closed on 3 January 1999. 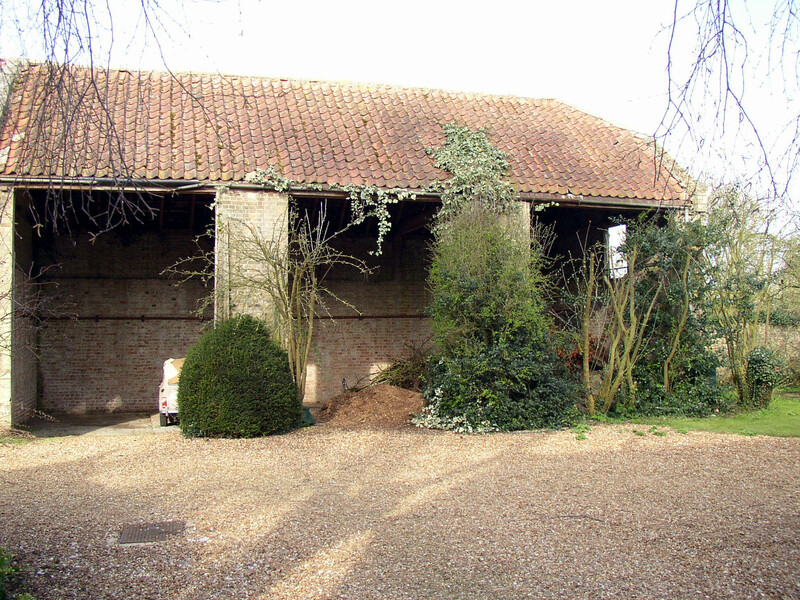 Location: Rear of Cherry Tree PH from 25 Nov 1979 to 3 Jan 1999. Opened by ECOC on ?? May 1939 (upon acquisition of Kitcatt). Closed on ?? July 1954. 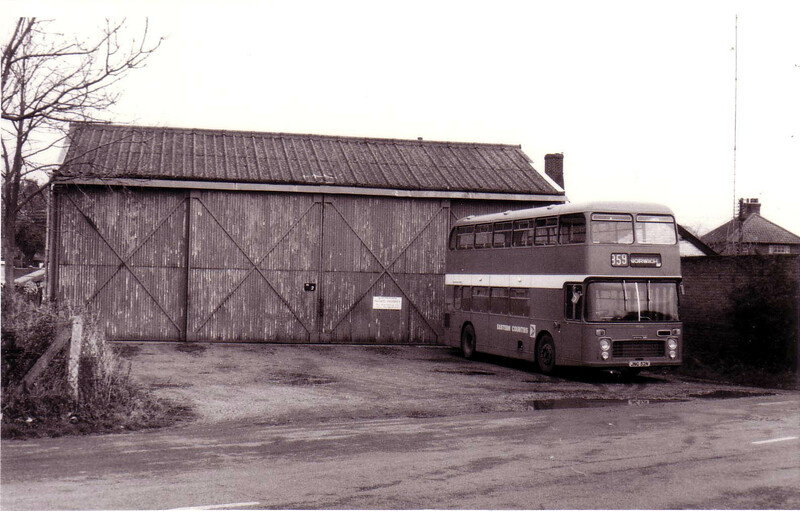 Location: Shed at 4, Church Lane from ?? May 1939 to ?? July 1954. Opened by ECOC by ?? June 1936. Closed on 26 January 1984 (Transferred to United Counties O C). Locations: 1. Two sheds in North Road from ?? Jun 1936 to ?? (pictured above left). 2. 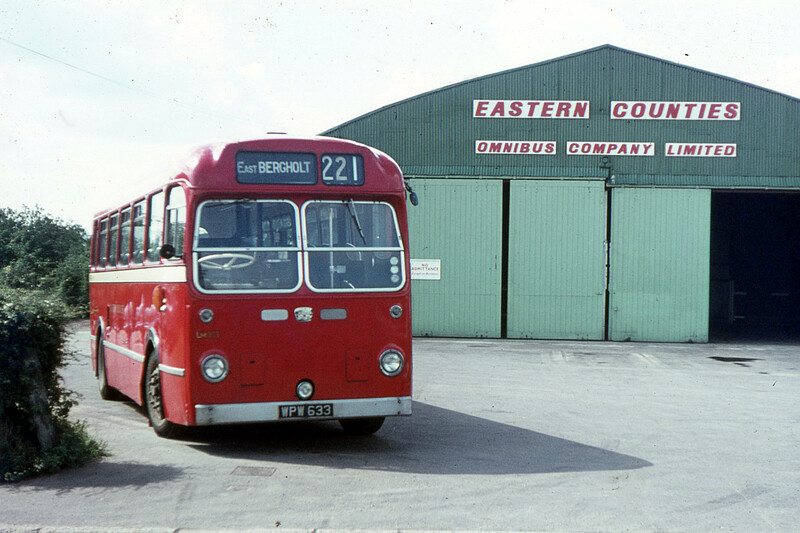 Burgess & Walker Transport, Needingworth Industrial Estate from ?? to 26 Jan 1984. Opened by Peterborough Electric Traction Company Ltd by 1 August 1930. Closed on 21 September 1980. 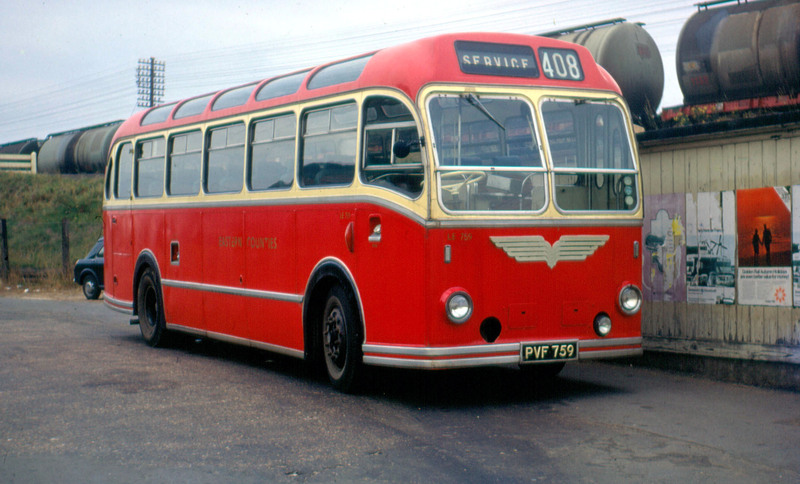 Location: Garage in Bridge Street from 1 Aug 1930 to 21 Sep 1980. Opened by ECOC by ?? April 1959. Closed on 9 September 1984 (Transferred to Cambus). Locations: 1. Depot acquired from Longlands from ?? Apr 1959 to ?? 2. Open parking at George Smith Motors, Peterborough Road from ?? to ?? (pictured above). 3. Open parking at Broadway Garage, Broadway (A1073) from ?? to 9 Sep 1984. Opened by United Automobile Services Ltd by 1 August 1930. Closed on 5 June 1983. Locations: 1. Shed at rear of Crown Hotel from 1 Aug 1930 to ?? 1974 (pictured above). 2. Open parking at Railway Station from ?? 1974 to 5 Jun 1983. Opened by ECOC by ?? 1945. Closed on 15 February 1970. Location: Rented shed at Seaman's Garage, Abbey Road from ?? 1945 to 15 Feb 1970. 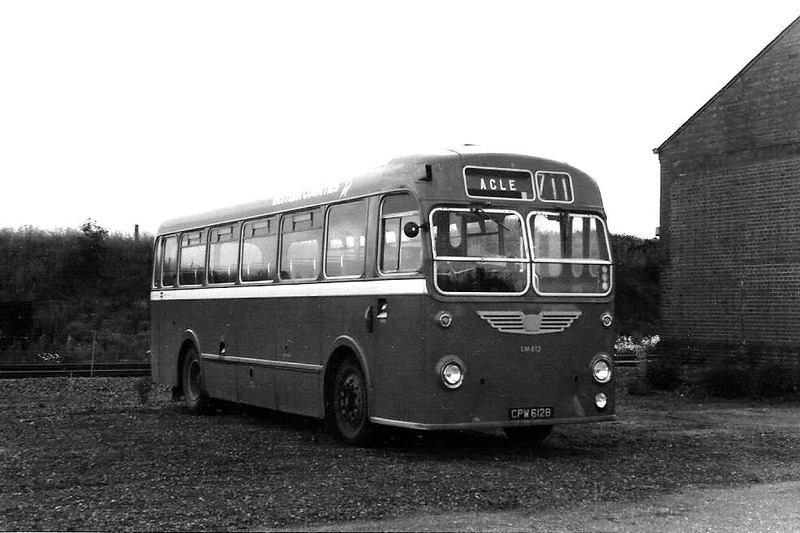 Opened by ECOC on 1 January 1951 (upon acquisition of W J Rasberry). Closed on ?? June 1962. 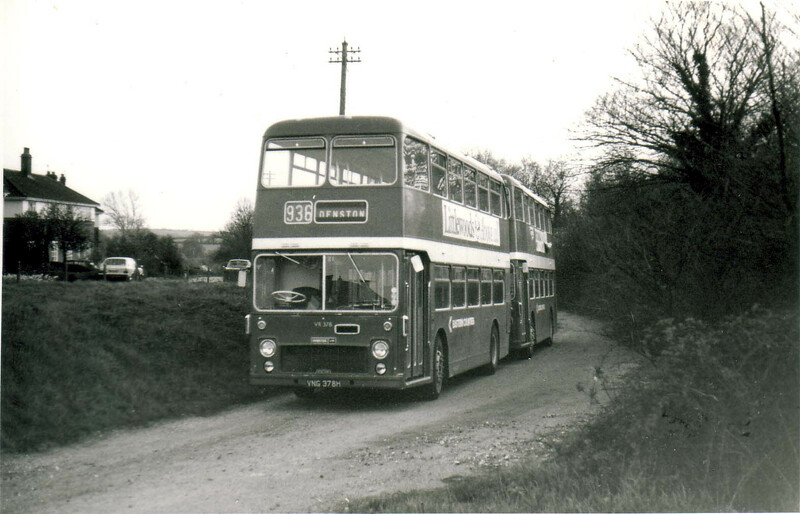 Location: Gayton Road (B1153) from 1 Jan 1951 to ?? Jun 1962. 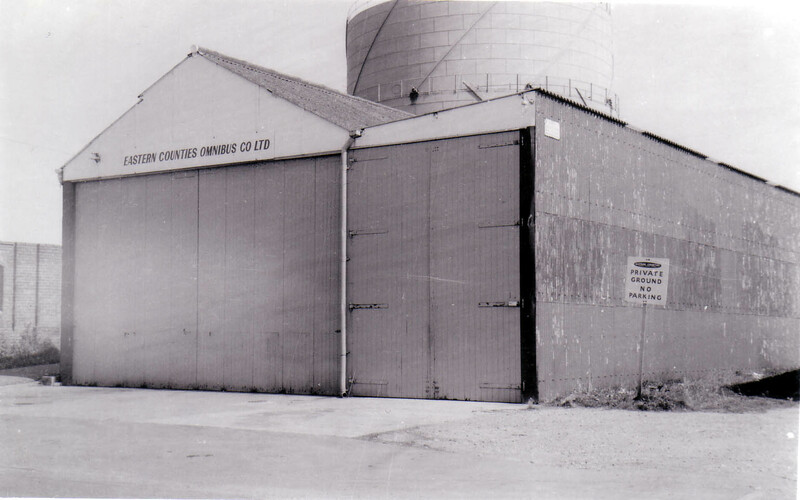 Opened by ECOC on 18 May 1980 (upon acquisition of Colin S Pegg). Closed on ?? March 1981. Location: Open parking at Red Lion PH from 18 May 1980 to ?? Mar 1981. Opened by United Automobile Services Ltd by 1 August 1930. Closed on 25 May 1987. Locations: 1. Shed in Bishops Road from 1 Aug 1930 to ?? 1973 (when demolished) (pictured above left). 2. Open parking in Bus Station, Westgate from ?? 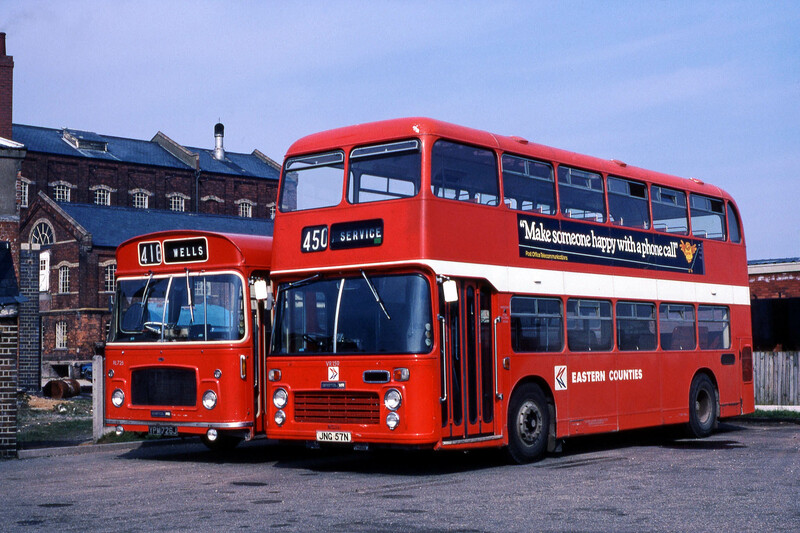 1973 to 25 May 1987 (pictured above right). Opened by ECOC by ?? 1952. Closed by ?? September 1990. Locations: 1. G E Burkett, Haulage Contractors from ?? 1952 to ?? Nov 1972. 2. Open parking in Wood Road (G E Burkett, Haulage Contractors from ?? Nov 1972 to ?? Sep 1990 (pictured above). Opened by Peterborough Electric Traction Company Ltd by 1 August 1930. Closed on 9 September 1984 (Transferred to Cambus). 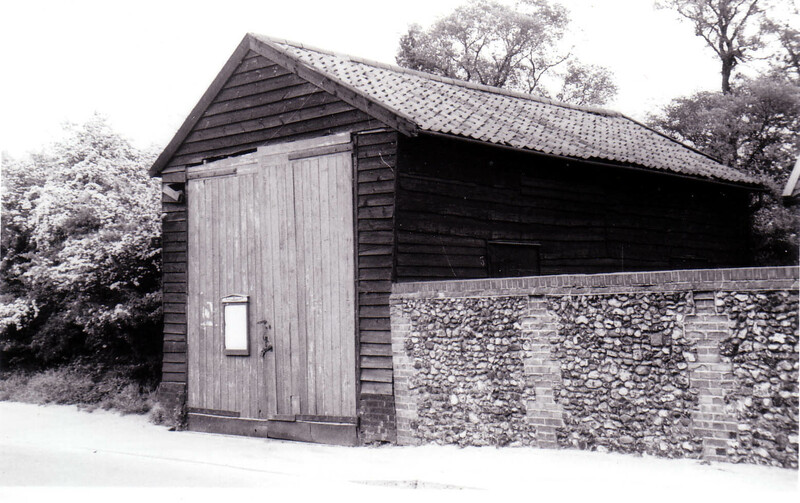 Location: Garage at 23, Horsegate, Deeping St James from 1 Aug 1930 to 9 Sep 1984. Opened by ECOC by ?? 1939 (upon acquisition from Crisp). Closed by 27 March 1982. Locations: 1. Stone barn on A134 from ?? 1939 to ?? 1950 (pictured above top left). Stone barn is now a private residence (pictured above bottom, left and right in Jan 2018). 2. Shed on A134 from ?? 1950 to ?? 1974 (pictured above top right). 3. Open parking at cafe on A134 from ?? 1974 to 27 Mar 1982. Opened by Peterborough Electric Traction Company Ltd by 1 August 1930. 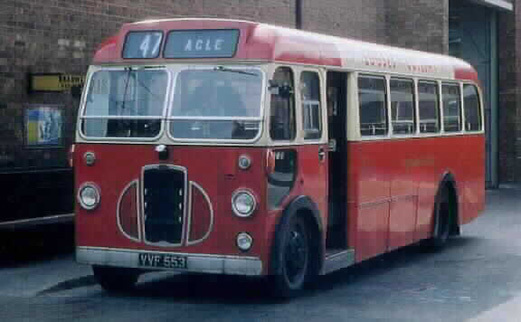 Closed on 9 September 1984 (Transferred to Cambus and then to Stagecoach Midlands who finally closed it on 15 January 2012). 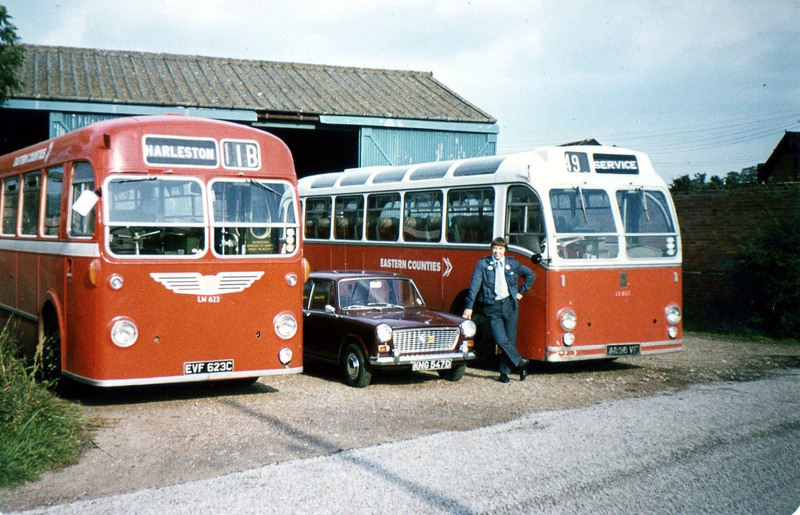 Location: Garage on Station Road (A605). Opened by ECOC by ?? 1931. Closed on 9 September 1984 (Transferred to Cambus). Location: Garage on Bury Road from ?? 1931 to ?? 1973 (pictured above). 2. Parking ground at Owl's End, Bury (off A1096) from ?? 1973 to 9 Sep 1984. Opened by Peterborough Electric Traction Company Ltd by 1 August 1930. Closed on 4 September 1944. Opened by ECOC on ?? April 1959. Closed on 9 September 1984 (Transferred to Cambus). Locations: 1. 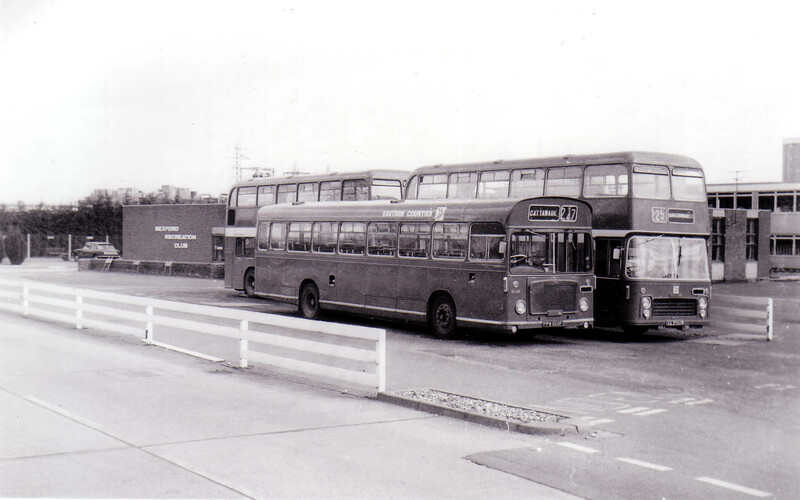 Open parking at Spalding bus station from ?? Apr 1959 to ?? Jun 1968. 2. Open parking at the Railway Station from ?? Jun 1968 to 9 Sep 1984. Opened by ECOC on ?? June 1936 (upon acquisition of Ward Brothers). Closed on ?? September 1944. Location: Ward Brothers Garage from ?? Jun 1936 to ?? 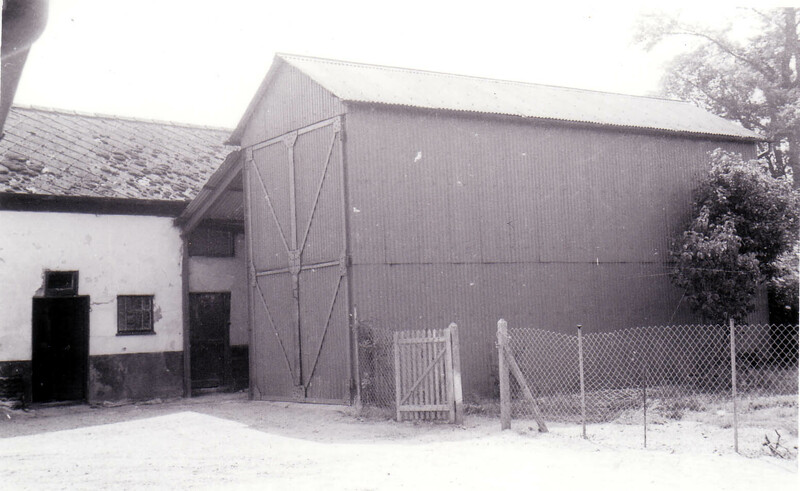 Sep 1944 (Garage later became the village hall). 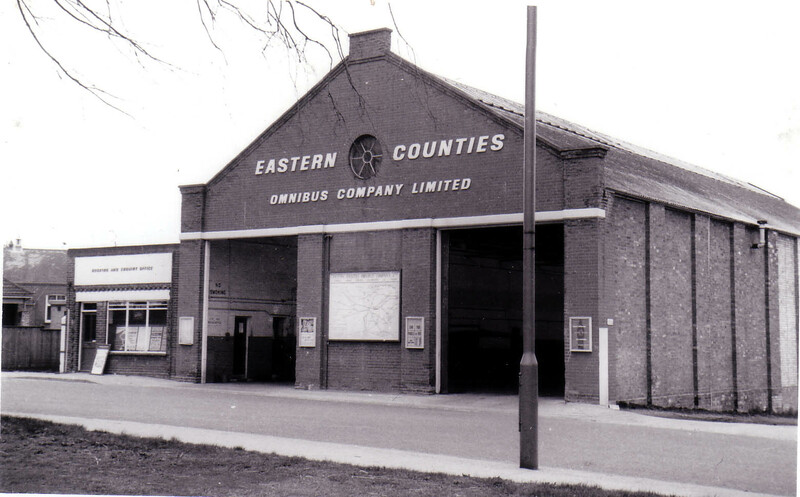 Opened by ECOC on 9 September 1968 (upon closure of the East Dereham to King's Lynn railway). Closed on 26 February 1983. Location: Open parking in Station Street, adjacent to Norfolk Hero PH from 9 Sep 1968 to 26 Feb 1983. Opened by ECOC on ?? July 1931. Closed on 1 July 1984. 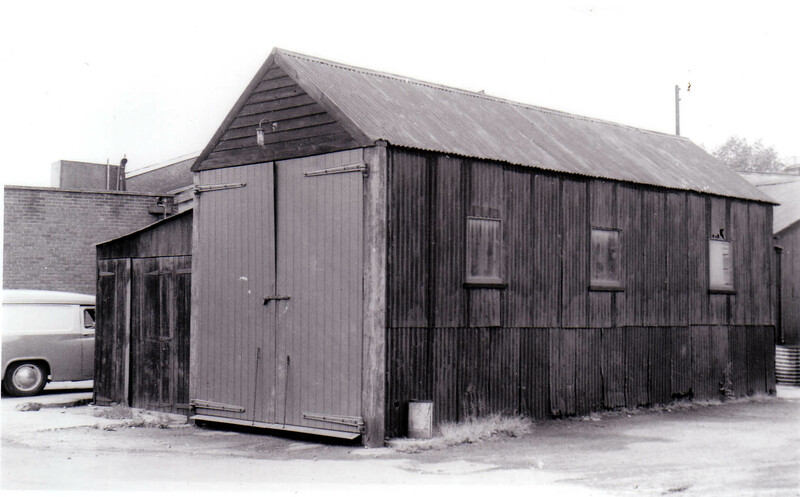 Location: Shed in Welney Road (pictured above) from ?? Jul 1931 to 1 Jul 1984. Opened by ECOC by ?? June 1952. Closed on 27 November 1982. Location: Open parking in Railway Station yard from ?? Jun 1952 to 27 Nov 1982. Opened by Peterborough Electric Traction Company Ltd by 1 August 1930. Closed on ?? January 1973. 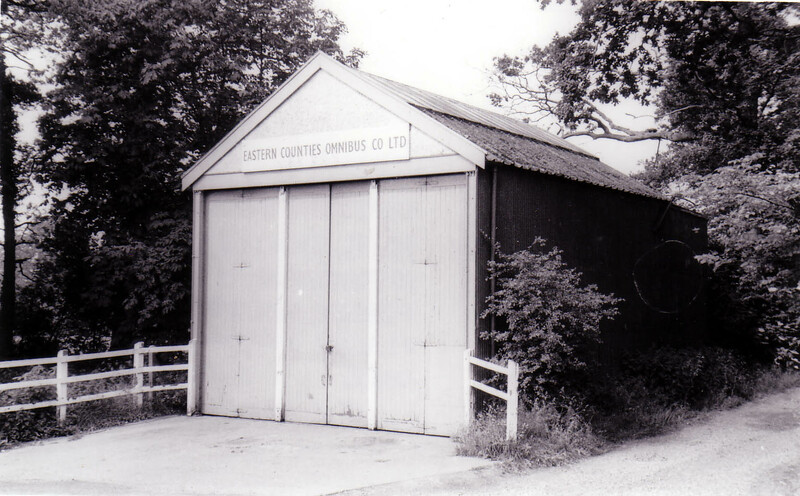 Location: Shed at 44, Church Street from 1 Aug 1930 to ?? Jan 1973. Click on the blue text below to reveal photographs of the bus stations. Please use your browser's 'back' button to return to this page after viewing each photograph.